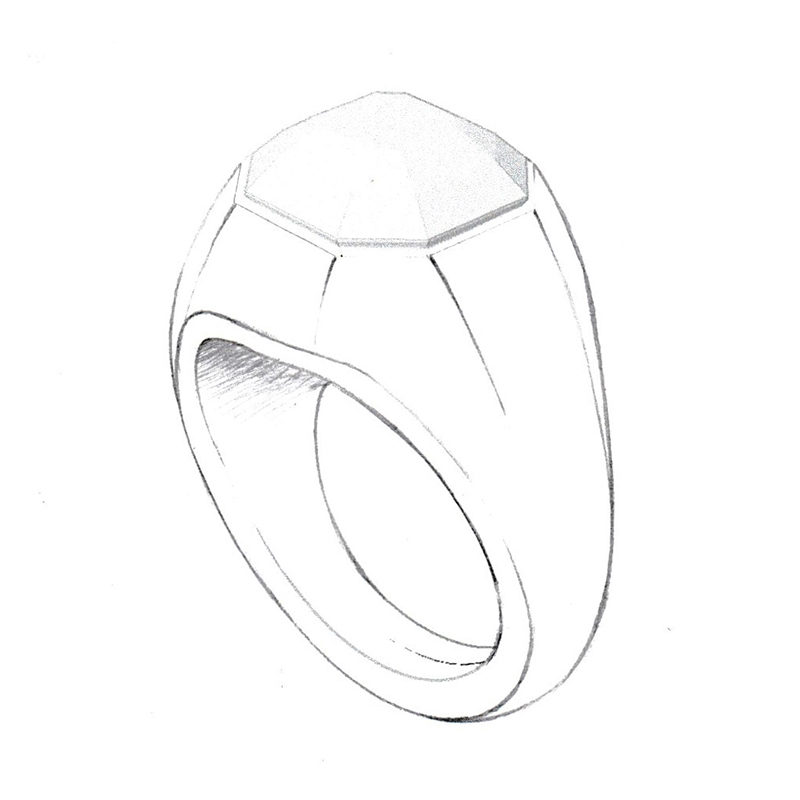 Comments : Now here is something very special and refined. 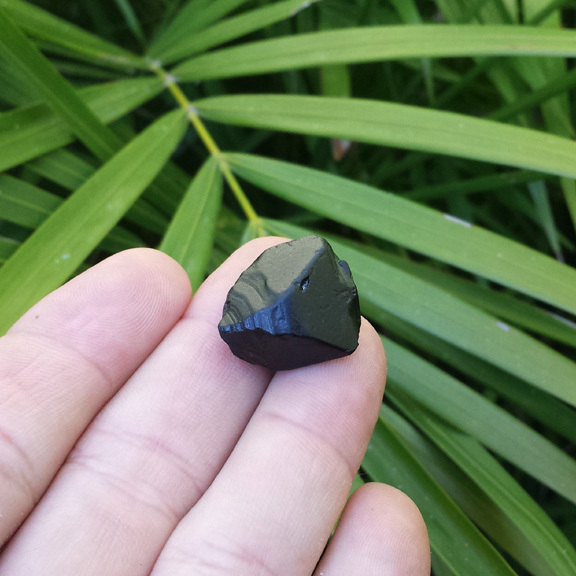 This is a beautiful black spinel from the Weld River in Tasmania. 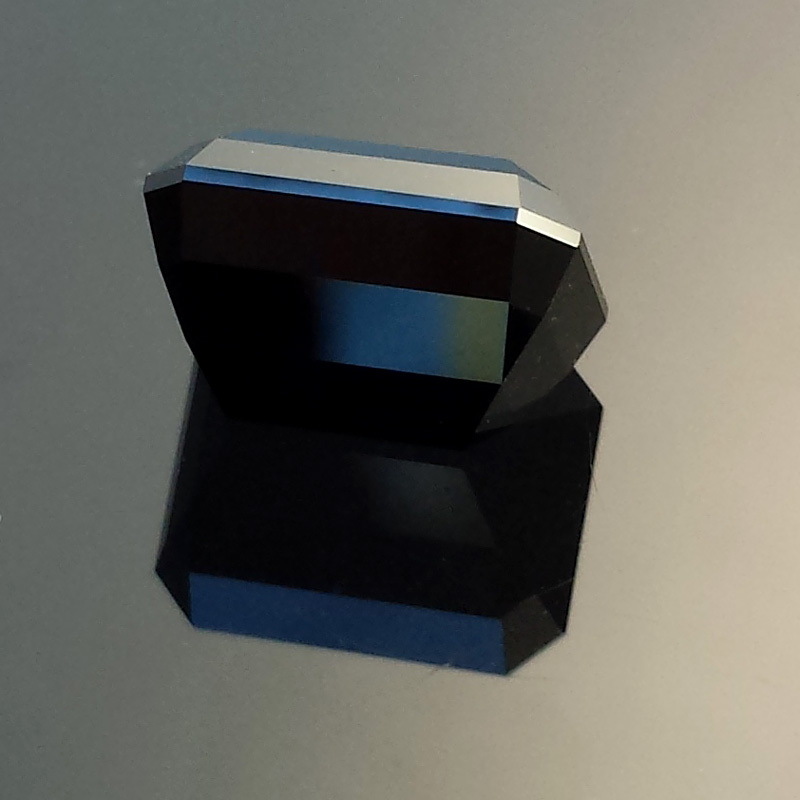 I have cut it in my Signet Asscher design which I created specifically for a lower profiled gemstone, such that would go into a men's signet ring or as a pendant. 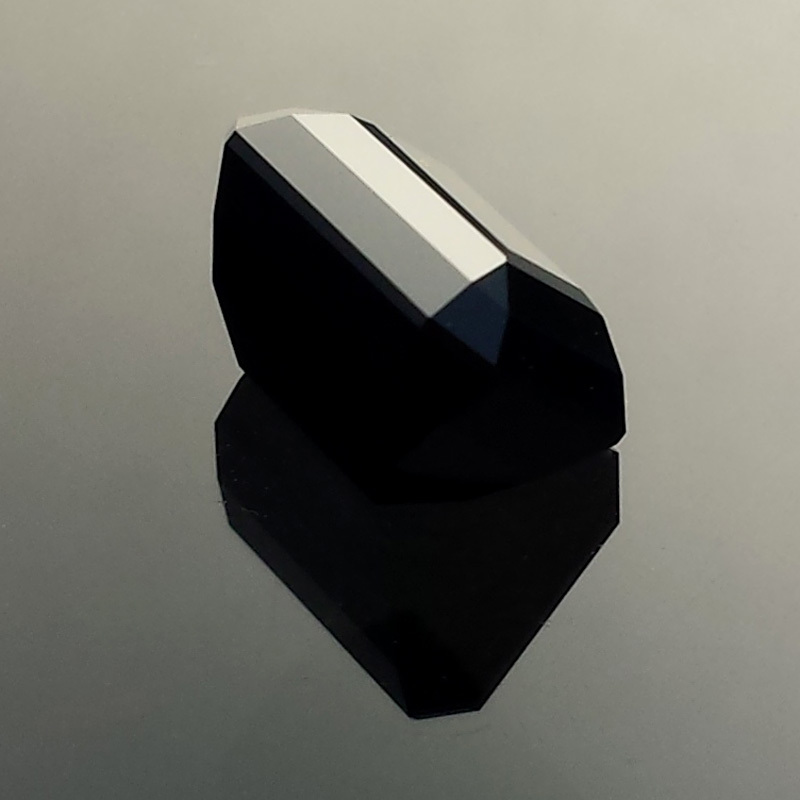 This is a very nice stone, the polish on this black spinel is superb and incredibly glossy, like a black piano key. 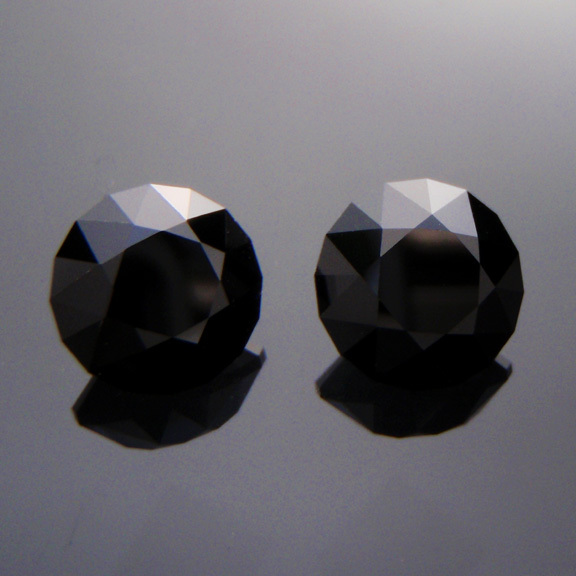 I personally love the simple, crisp geometric lines of this design, they look so good in polished black. 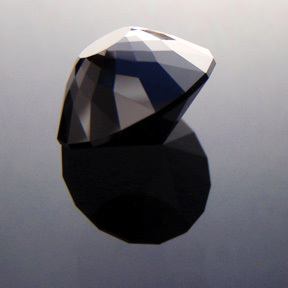 Spinel is quite hard wearing and ideal for any jewellery application. 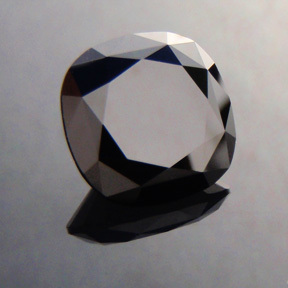 I am very proud to be able to offer such beautiful and unique Australian gemstones. 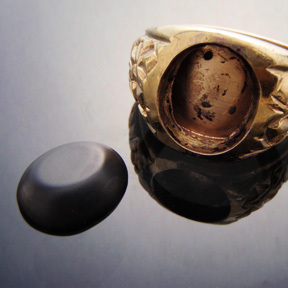 This piece holds special significance for me as it represents and embodies the magical alchemy that can come about from the flame of an idea in a person's mind. To manifest and bring forth an idea into the material draws upon the skills and experience of all involved, not just the artists but the client as well. 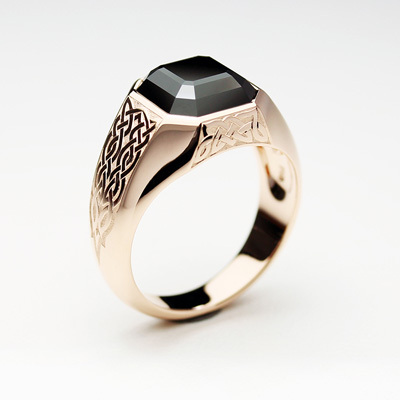 To my eye, everything about this ring is beautiful and perfectly balanced. 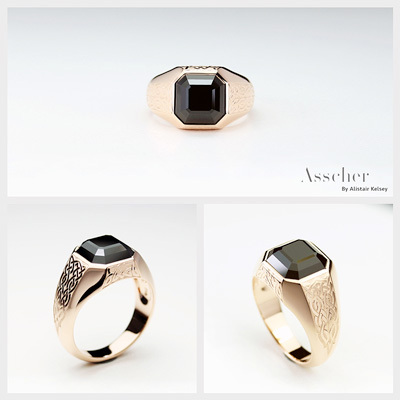 The black spinel asscher styled gem that originally came from the wild Weld River of Tasmania, a stone that is hundreds of thousands of years old, tumbled in the river's waters to one day be found by a lucky fossicker. 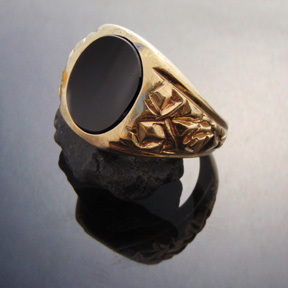 That stone makes it way to me, only the second pair of hands to touch it. Then one day a client walks in and expresses his desire for a signet ring and it must have a Weld River black spinel in it. 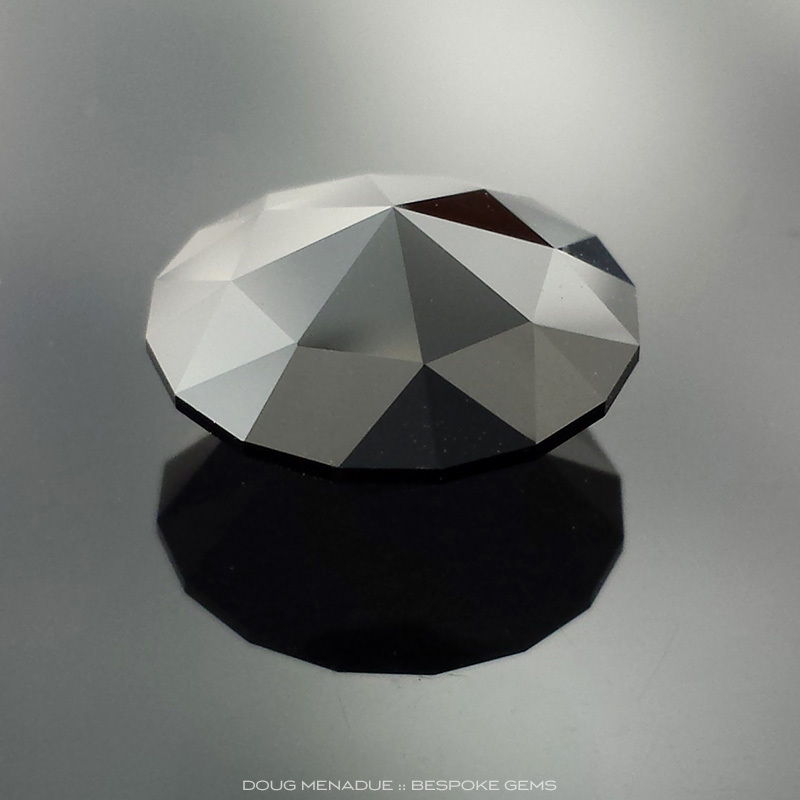 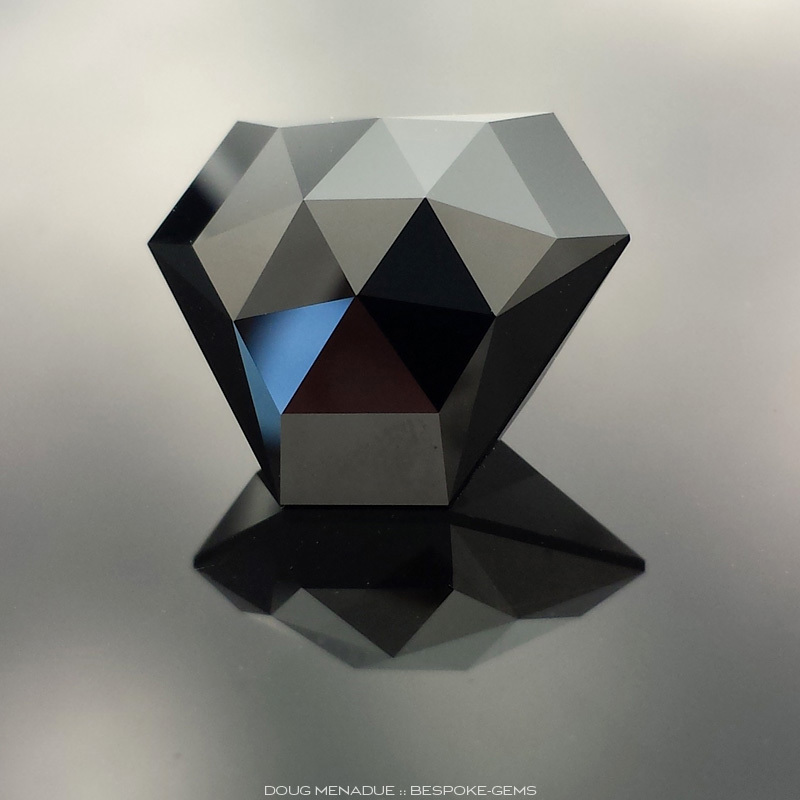 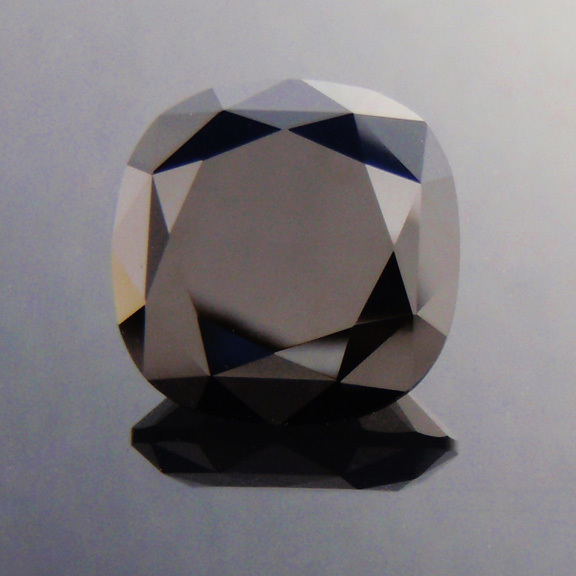 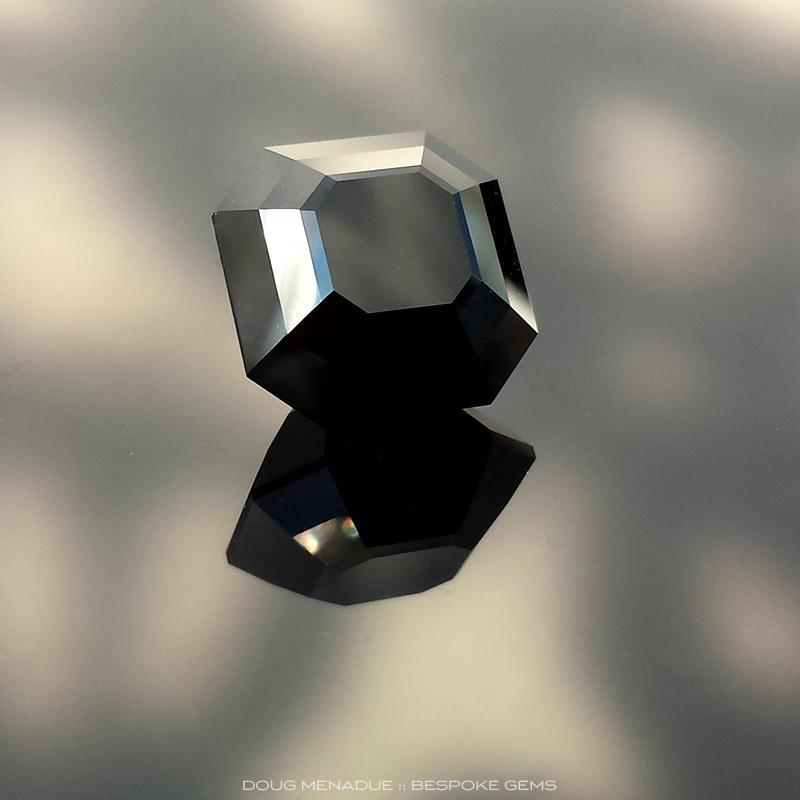 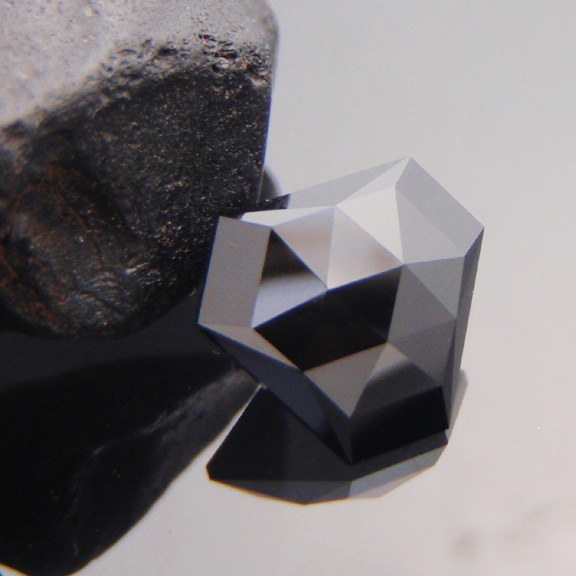 The Signet Asscher design seems to us the perfect design for this project and I proceed to cut and polish the new gem. 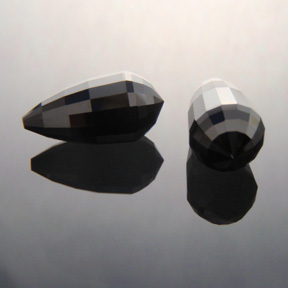 I am, as a gemcutter, acutely aware that every act of creation (at least in the context of cutting a gemstone) requires an act of destruction. 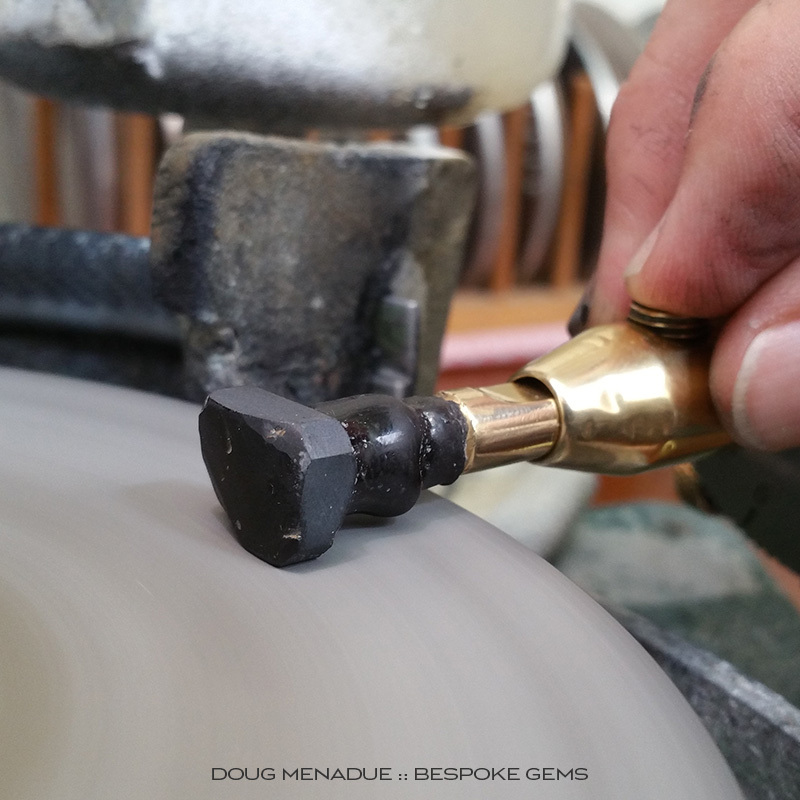 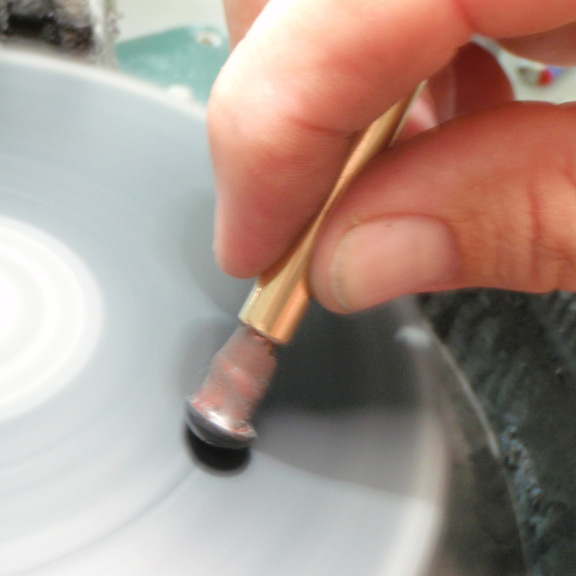 I must unmake some of the ancient rough stone, grinding it away in order to bring forth the new polished gemstone. 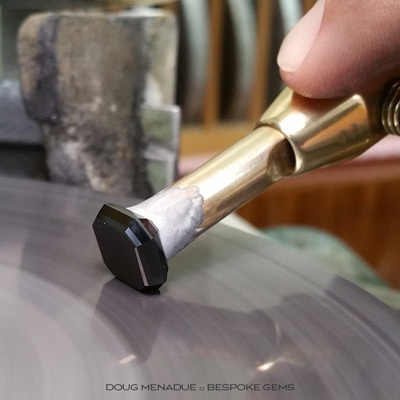 It's a small thing I know, but it is something I am conscious of with every gem I cut. 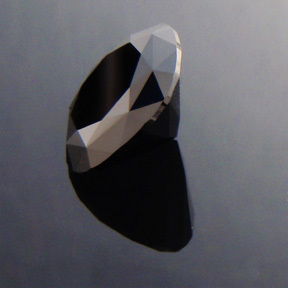 Once the gem was finished I handed it over to the very talented Alistair Kelsey. Alistair has worked with and set quite a number of my gems in the past and I knew that he would be able to conjure up something very special for this project. 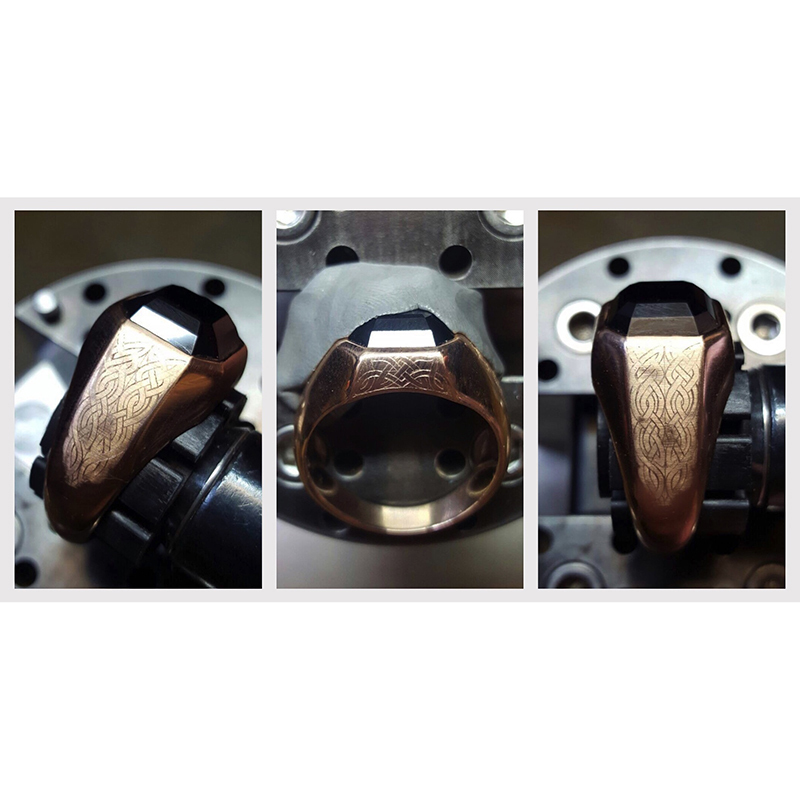 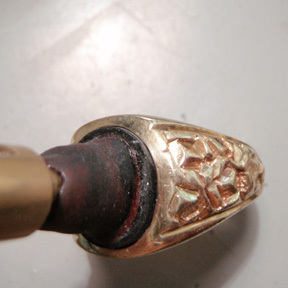 Lado Shili, engraver extraordinaire, gave of his skills to really take the ring to the next level. 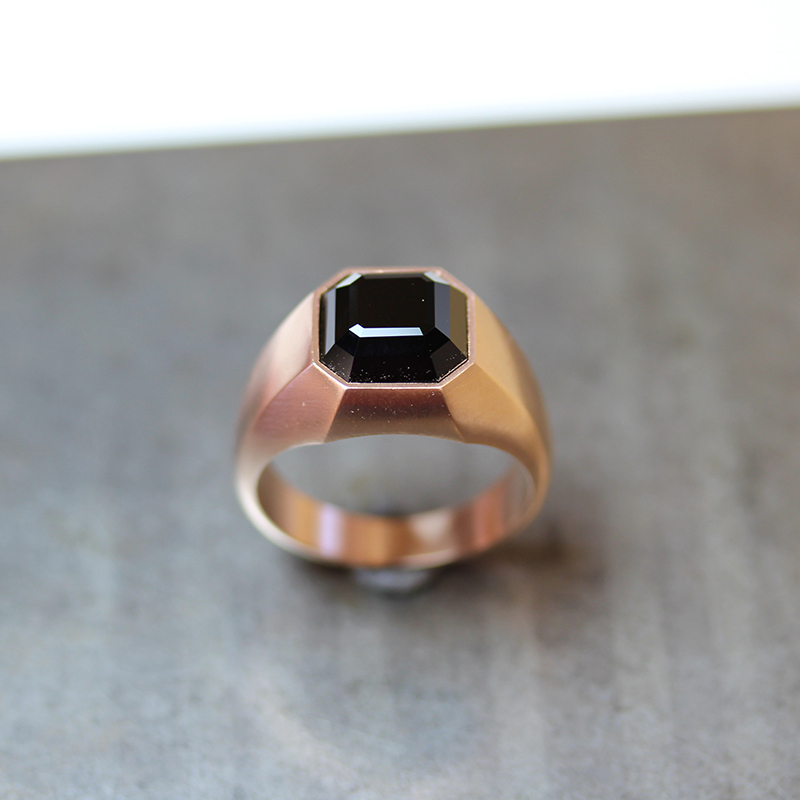 I was very excited to see pictures of the finished ring and how it turned out. 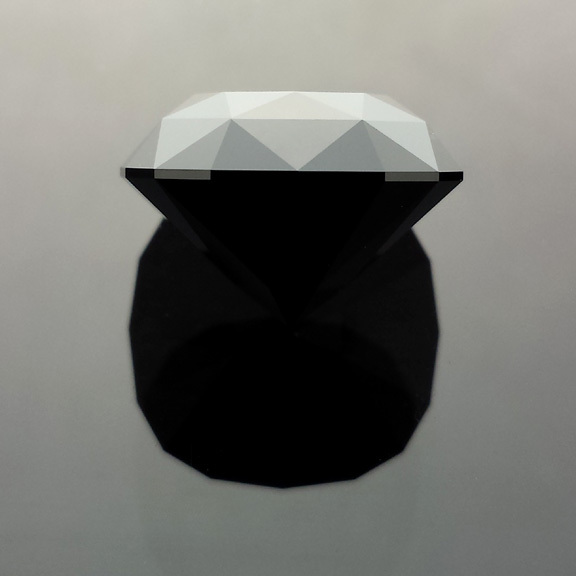 It was a job well done by all involved and the client was very happy with the results. 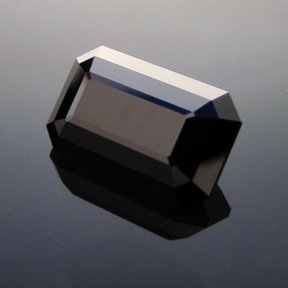 Comments : Black spinel is THE black gemstone of choice. 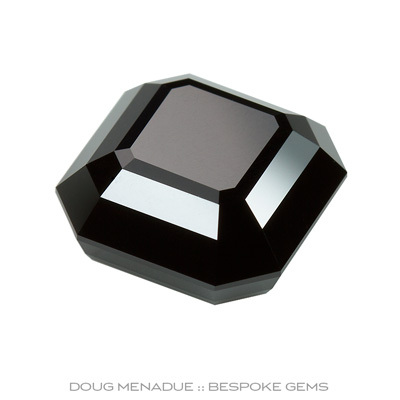 It has a superior pure black colour and the polish is superb, lovely and glossy. 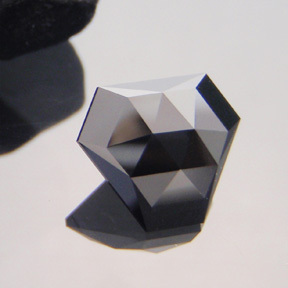 This is a very beautiful black spinel that I cut in my Signet Asscher design which gives a lower profile finished stone. 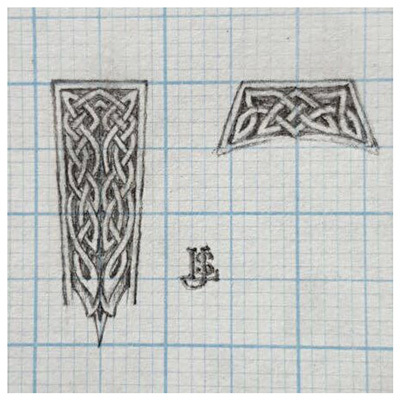 This design would be suitable for any jewellery application but would really suit a suite of tailored men's jewels, like a signet ring, cufflinks and buttons. 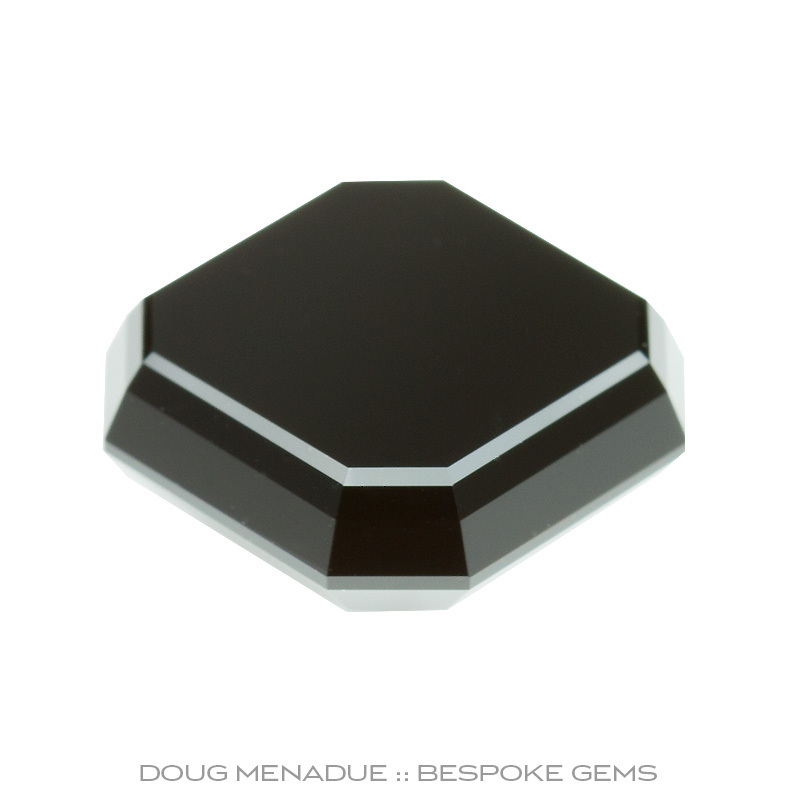 This would make for a very refined and unique finish to an evening suit or tuxedo for that special occasion. 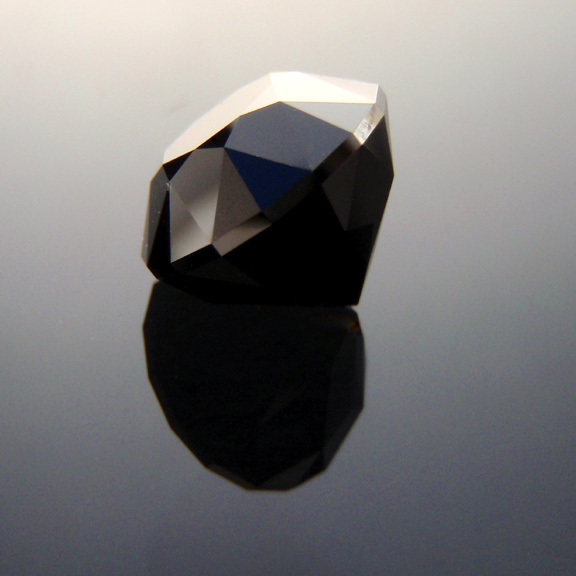 Comments : Big and beautiful, this is a rare gem as you rarely see black spinel cut like this. Black spinel is THE black gemstone of choice and cuts a pure black. As an asscher it is awesome and has a definite presence. 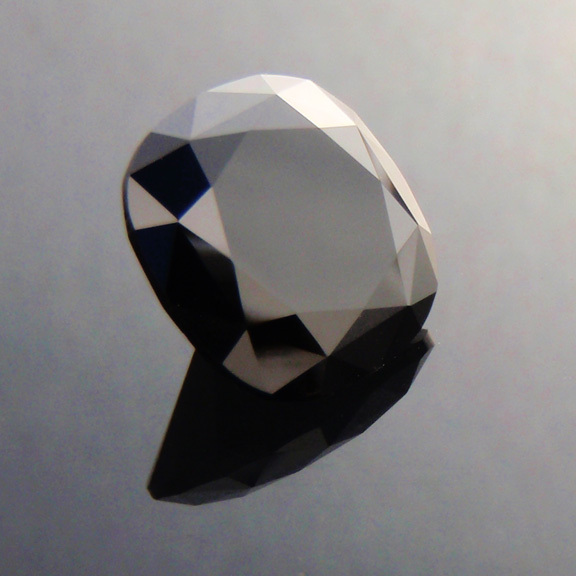 A great stone! 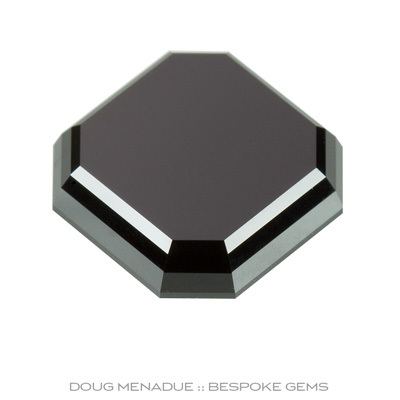 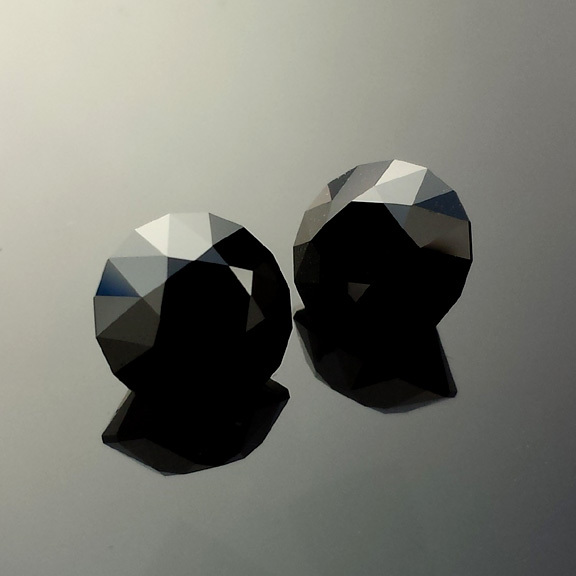 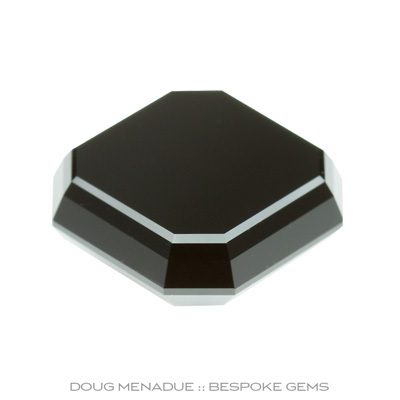 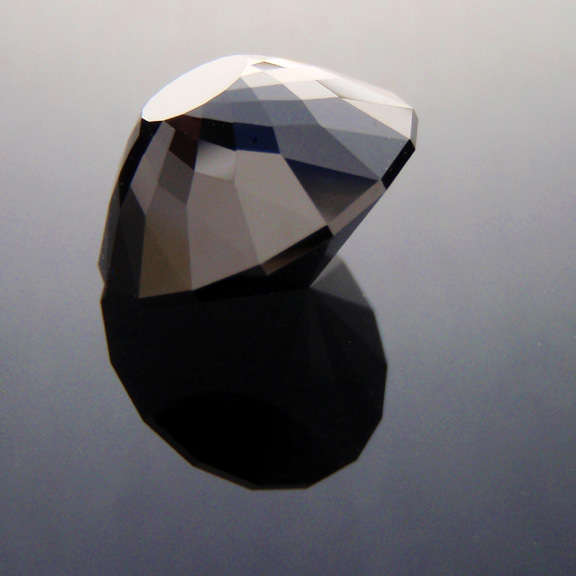 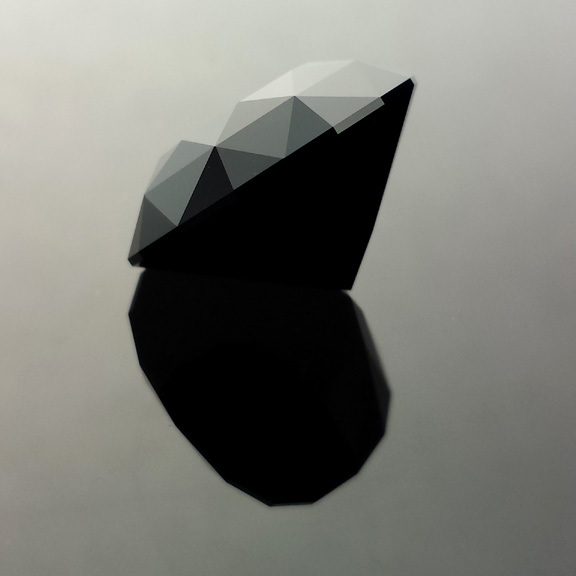 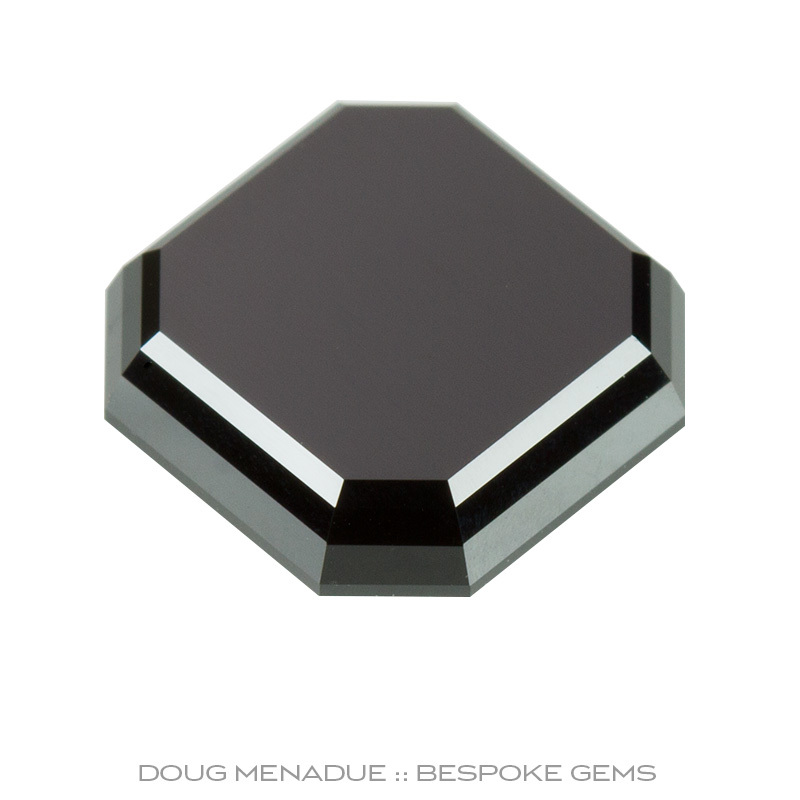 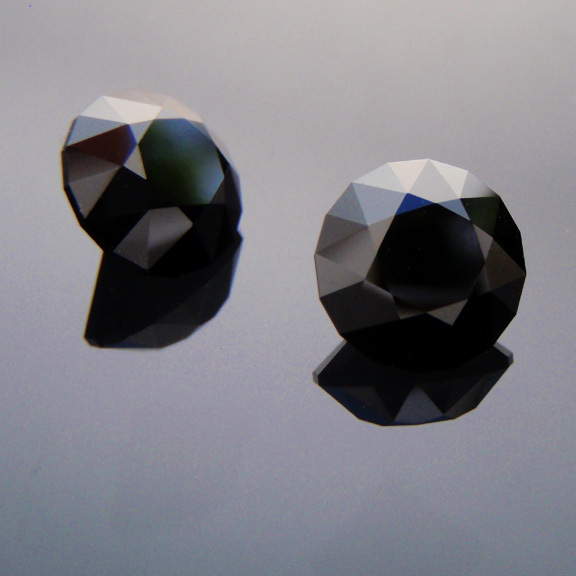 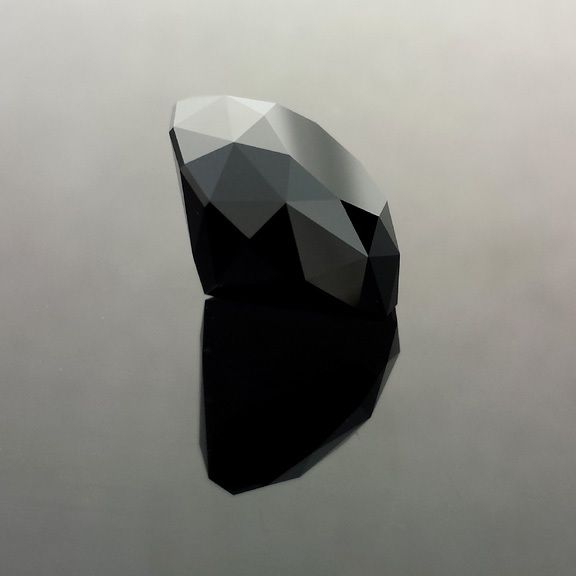 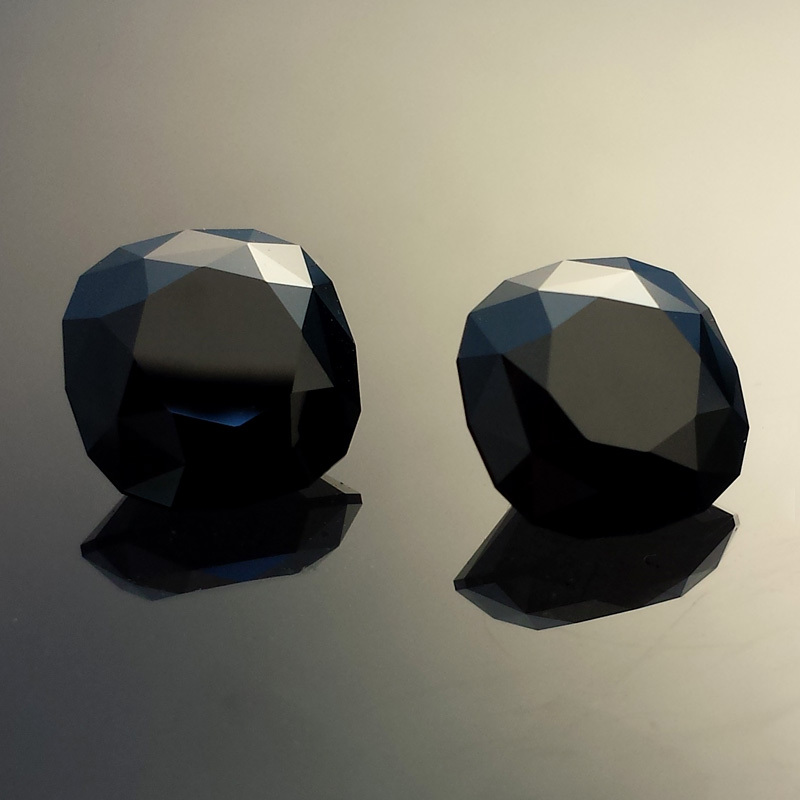 Comments : Here is a beautiful glossy black spinel cut in a design that would be perfect for any jewellery setting. 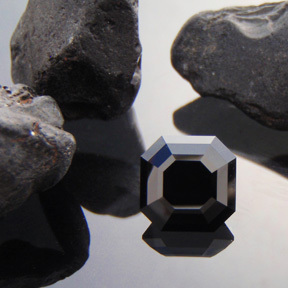 Black spinel is THE black gemstone of choice. 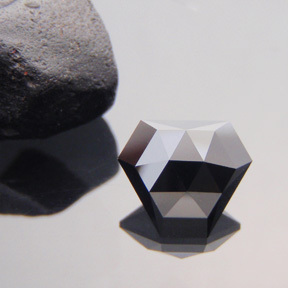 It has a pure black colour unlike black diamonds which tend to be a steely grey colour. 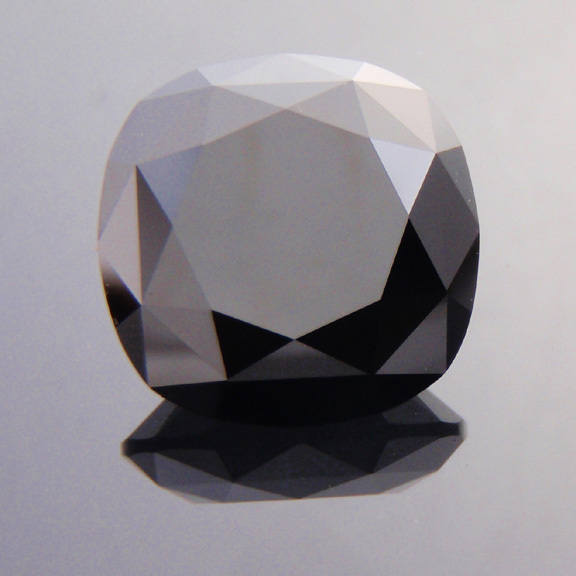 This is a very fine natural black spinel gemstone! Comments : Simply a big stunning black spinel! This gem was cut from a stone that the client found himself while fossicking in the Weld River in Tasmania. 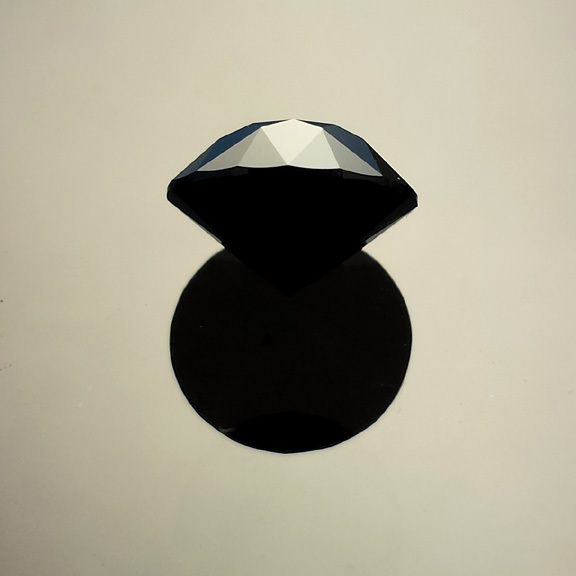 I cut this in the modern Tut's Pyramid design which is perfect for black spinel. 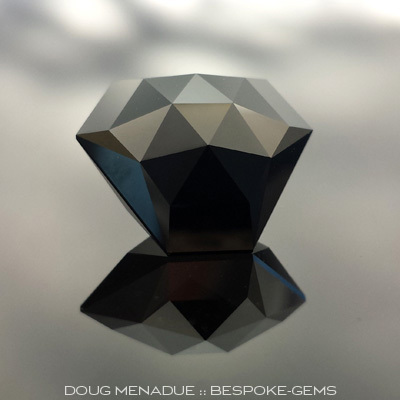 A top shelf gem! 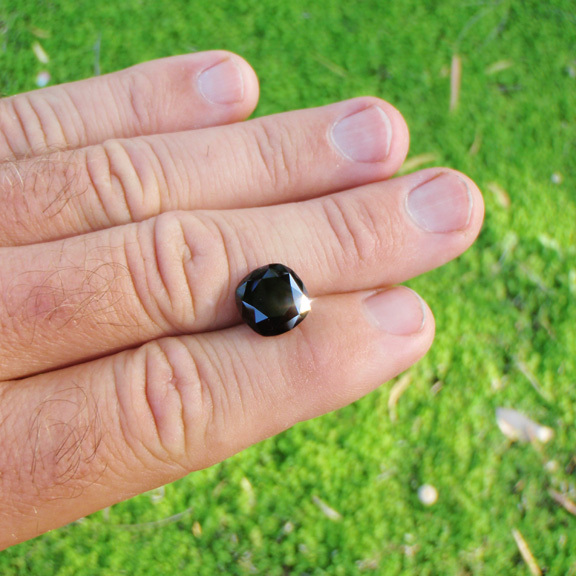 Comments : Here is a fine Australian black spinel from the Central Queensland sapphire gemfields near Rubyvale. 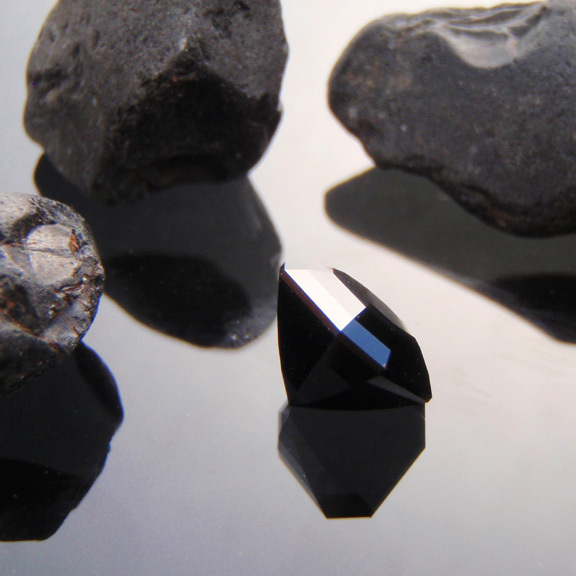 Black spinel is without equal when it comes to black gemstones. The colour is pure black with no secondary tones. 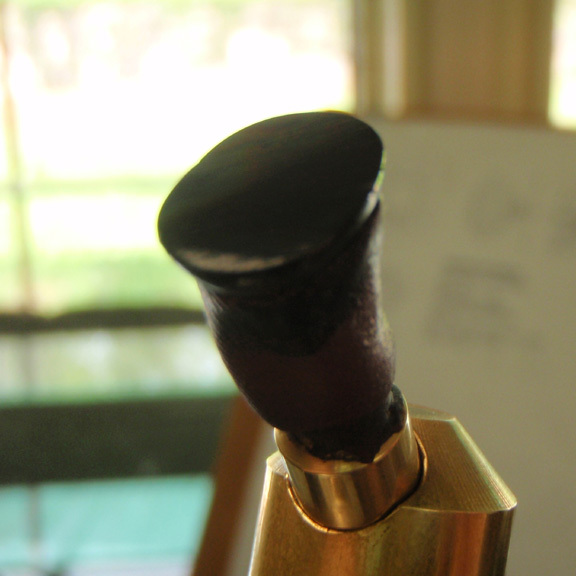 The lustrous glossy polish is like the finest ebony piano key and creates a feeling of being able to look into the stone. 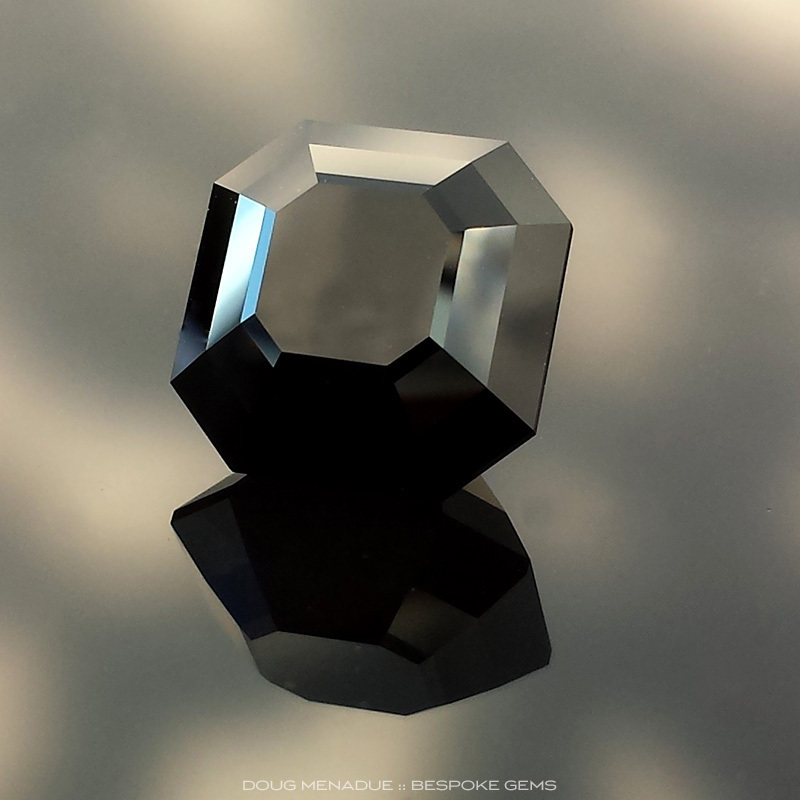 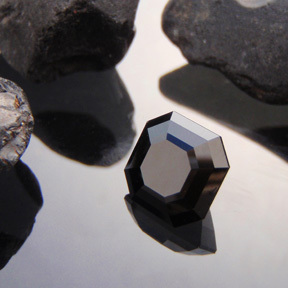 If you are looking for a black gemstone, look no further. 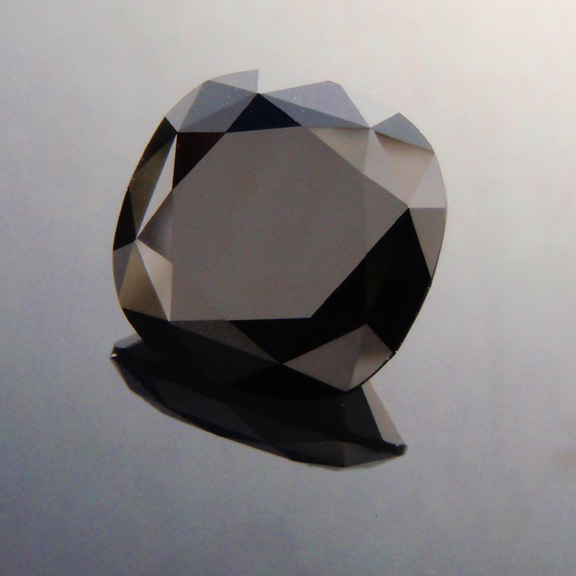 * In terms of inclusions, there are two very very tiny specks on the surface of two facets on the crown. 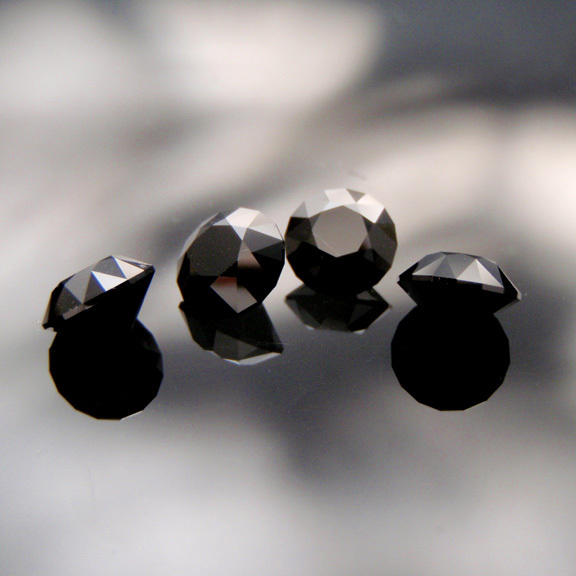 They are smaller then a pin prick and do not detract from the overall appearance of the gem. 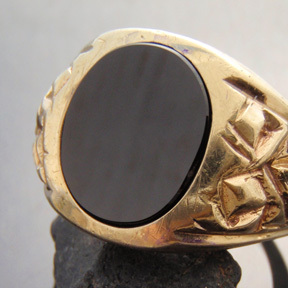 You really need a magnifying glass to spot them. 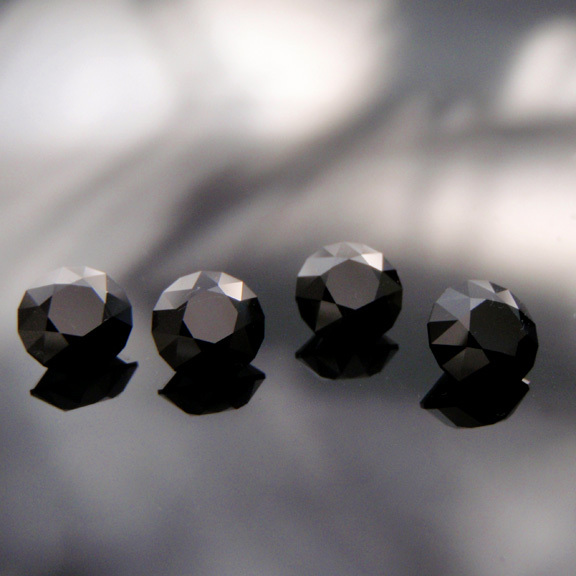 I have a feeling that these might be very very tiny zircon crystals as I know they do occur in black spinel and sapphires from this location. 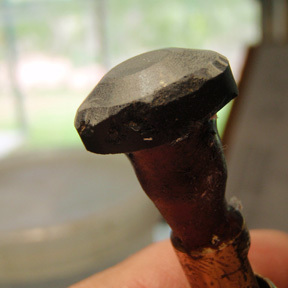 However you'd really need a microscope and someone, a gemologist, who knows what they are looking at. 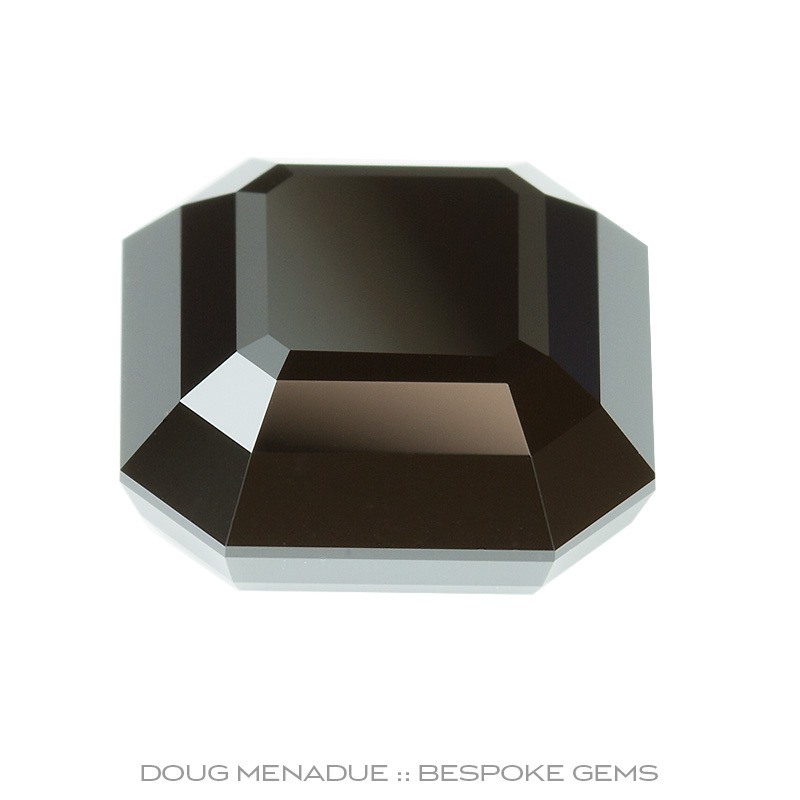 Comments : A beautiful pair of matched black spinel cut in my signature cushion cut, the Victoria Regent. 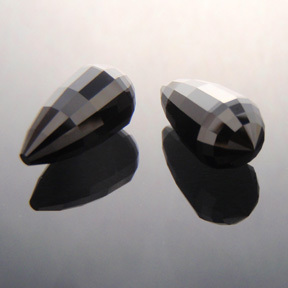 I think this pair are destined for a pair of men's cufflinks. 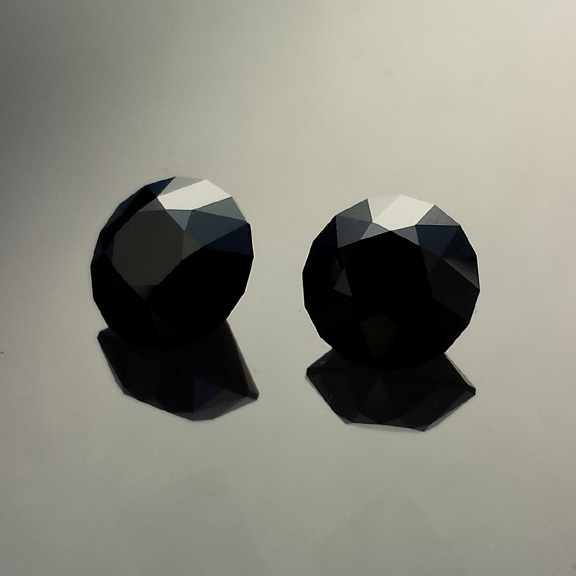 Comments : A very nice pair of matched black spinels. 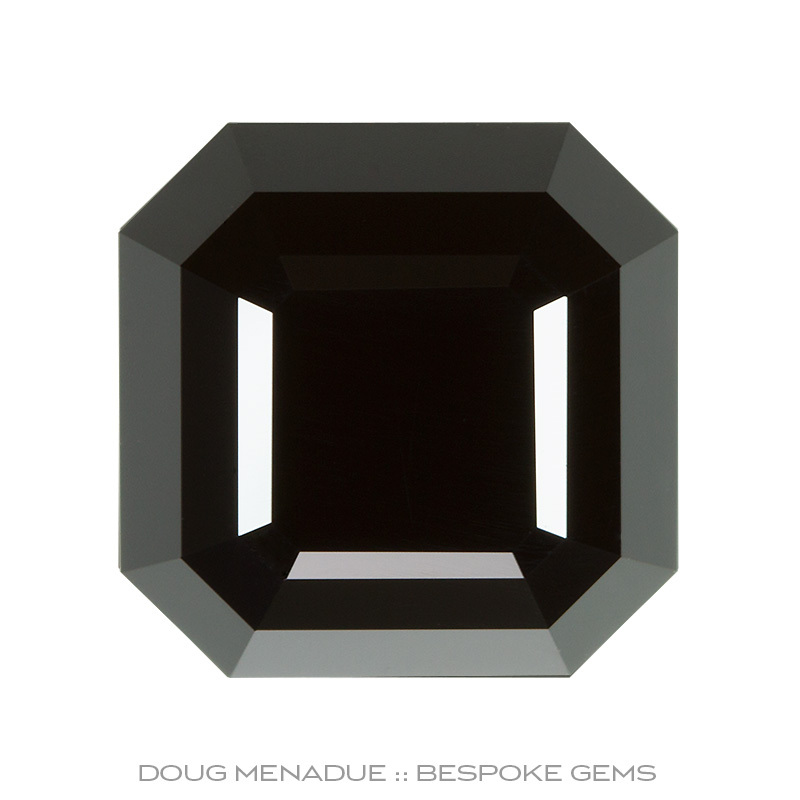 Comments : A superb black spinel cut in the classic Emerald Cut. 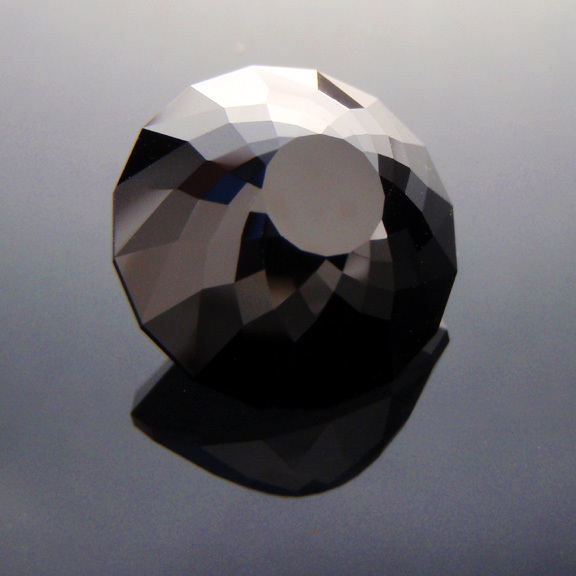 The long facets of this design really show off the glossy polish. Comments : A fine natural black spinel gems from the Central Queensland gemfields, nice and glossy, beautifully polished. 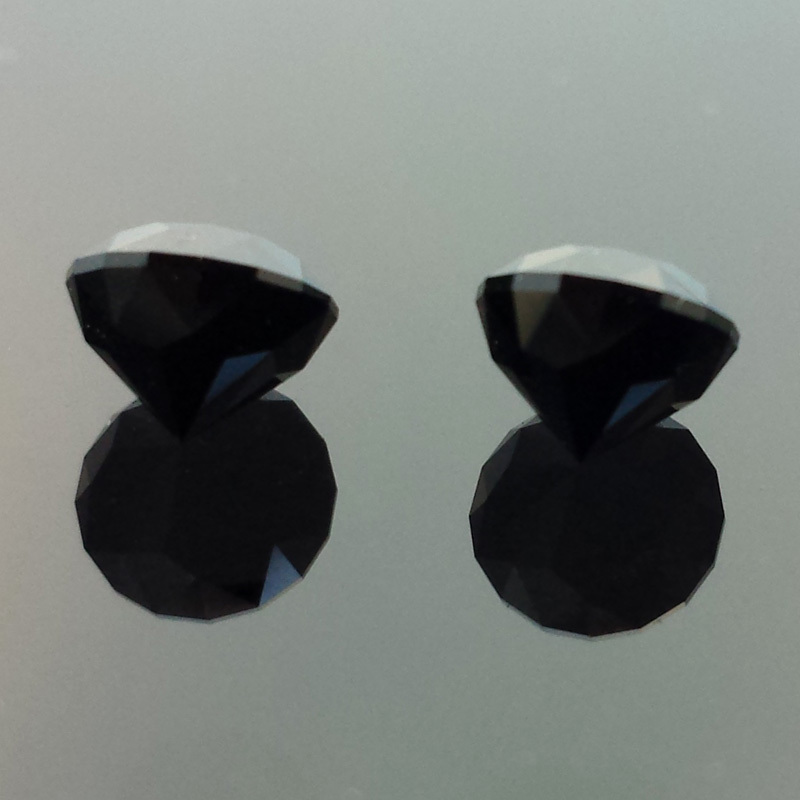 This gem was cut to complement the nice matched pair, #567. 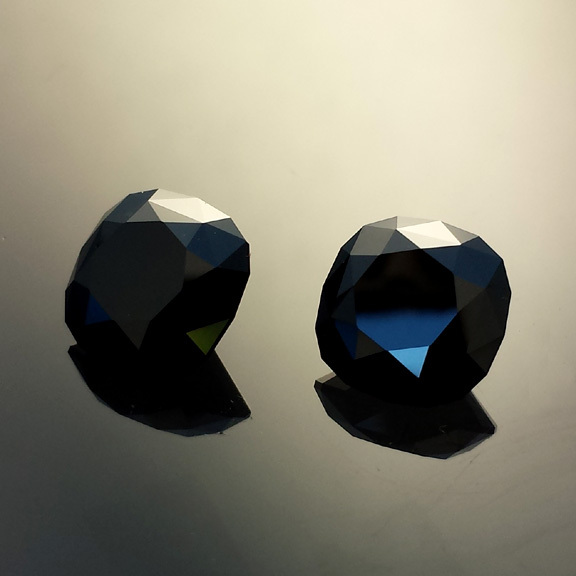 Comments : A wonderful matched pair of natural black spinel gems from the Central Queensland gemfields, nice and glossy, beautifully polished. 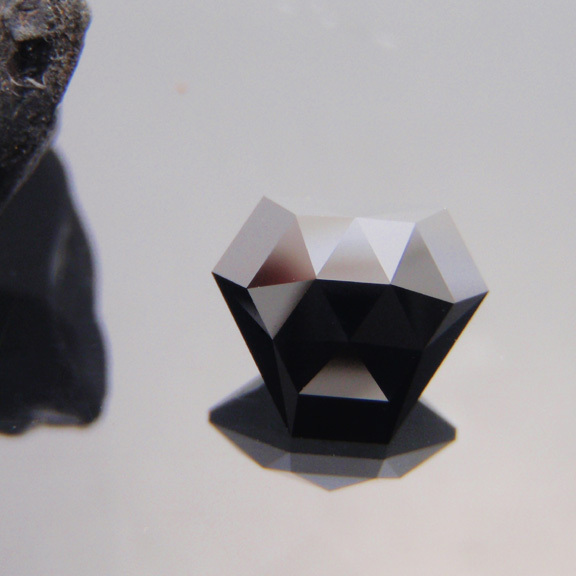 Black spinel is THE black gemstone! Comments : This is truly a stunning black spinel gemstone. 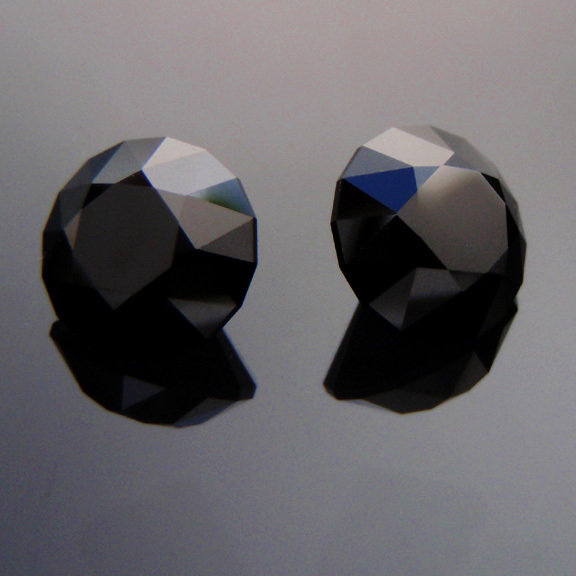 It is BIG and very very glossy. It is cut in my signature Victoria Regent design which works beautifully in this material. 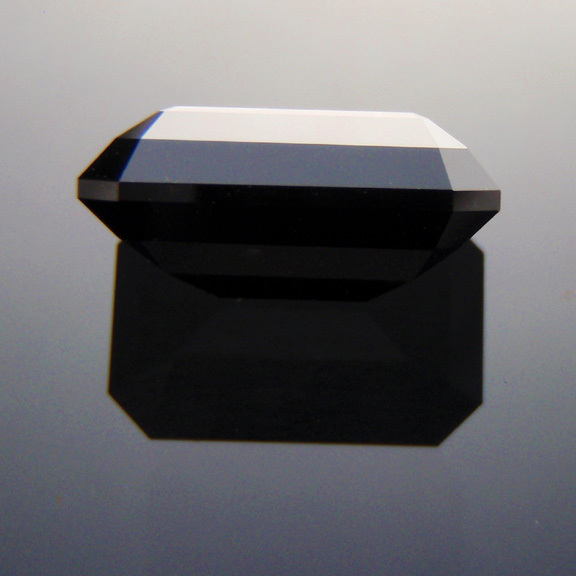 A very fine black spinel gem. Comments : An amazing matched suite of black spinel round brilliant bespoke gems. 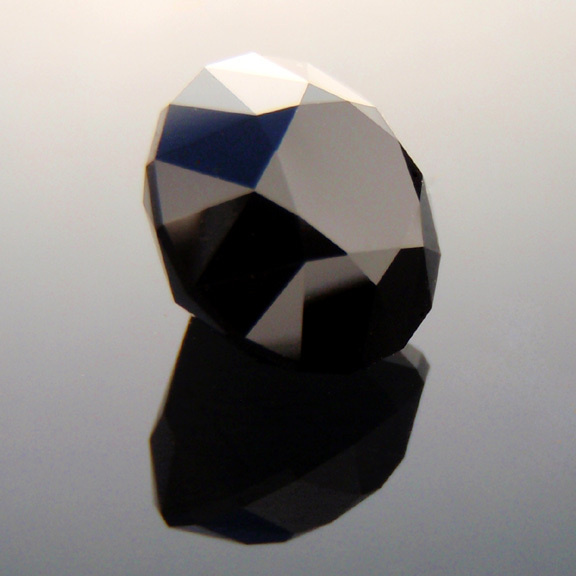 Black spinel cuts the nicest black gem around... it truly is ultra glossy and looks great. 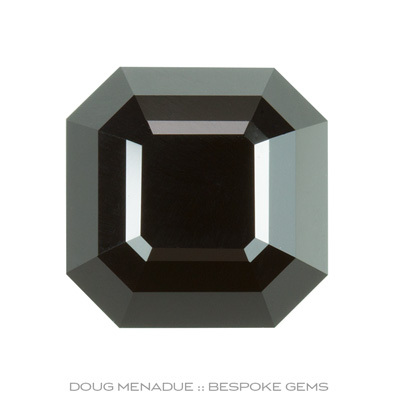 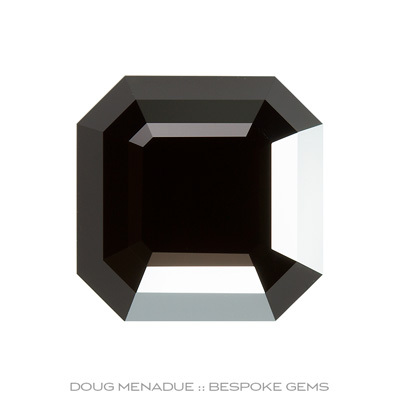 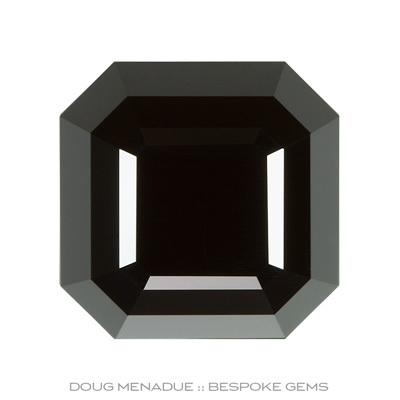 Comments : This beautiful gemstone is a lustrous black spinel cut in the classic Emerald Cut design. 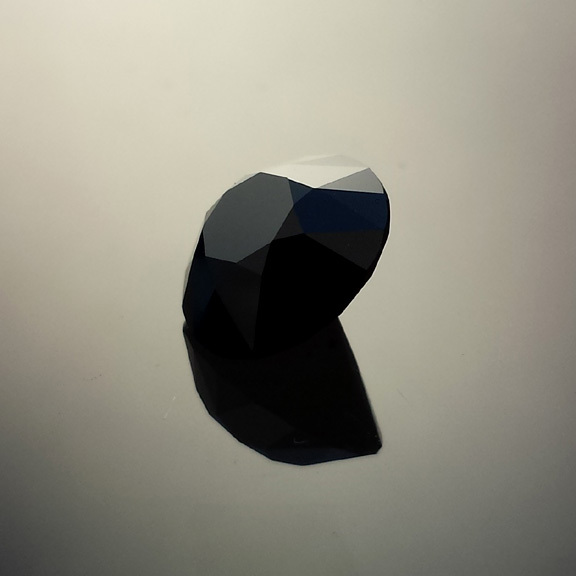 Black spinel takes an exceptionally glossy polish with the colour being a pure black. 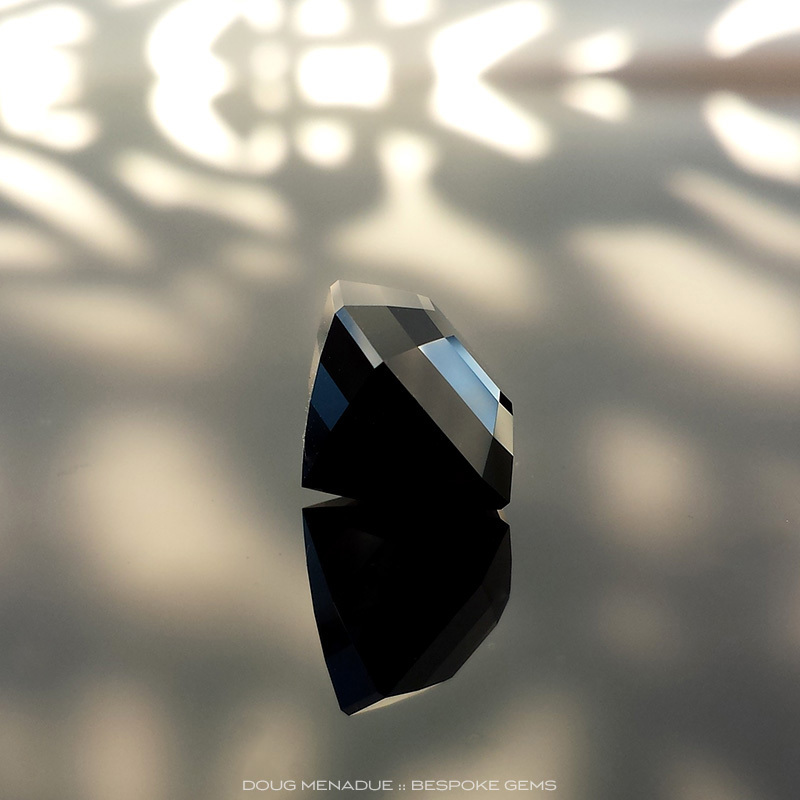 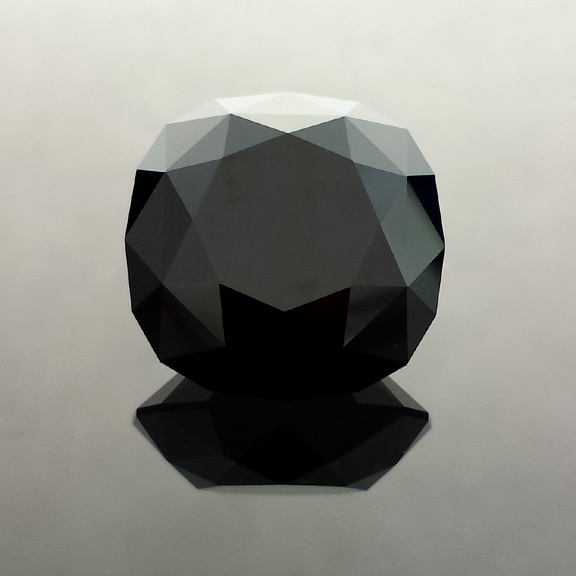 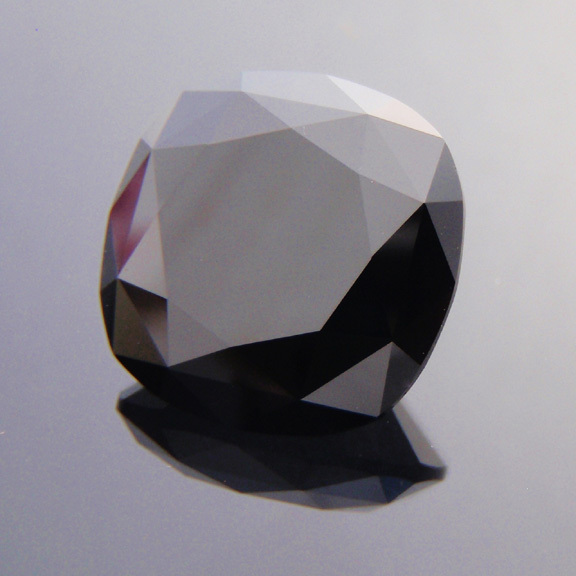 Black spinel is rarely seen precision cut, especially in a large size like this gemstone. 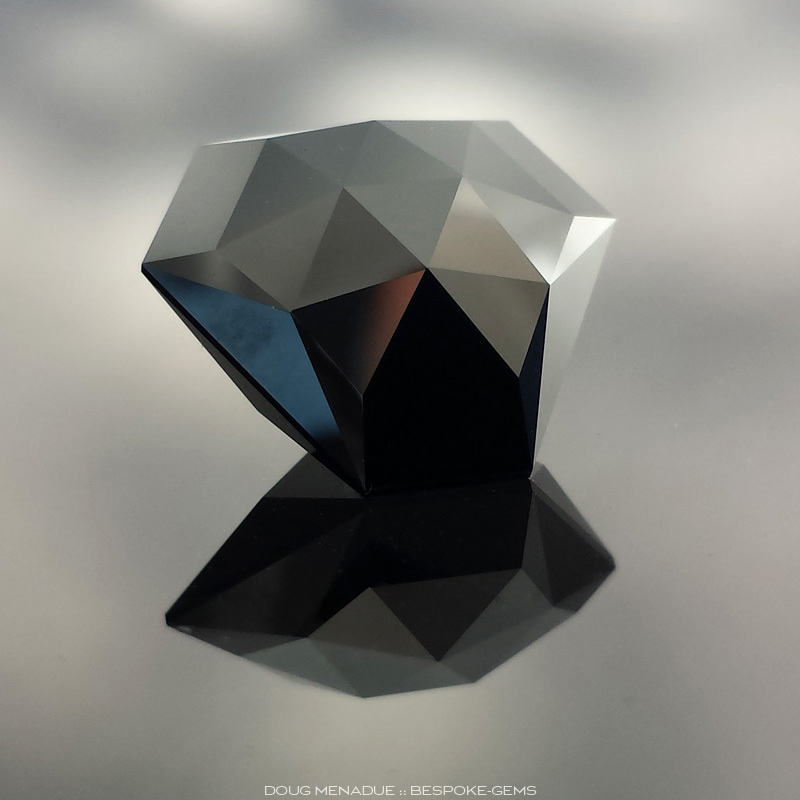 A different and intriguing gem. 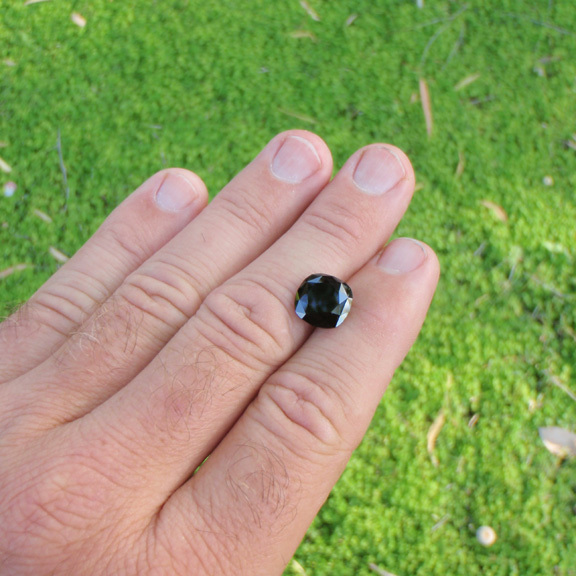 Comments : A beautiful, highly glossy black spinel from the Weld River in Tasmania. This is another location in Australia where very fine black spinel can be found. 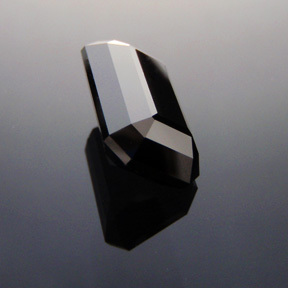 Black Spinel is the best material you can get if you are looking for a pure black gemstone. 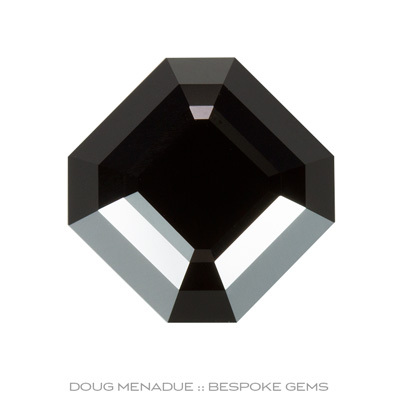 A very fine gem! 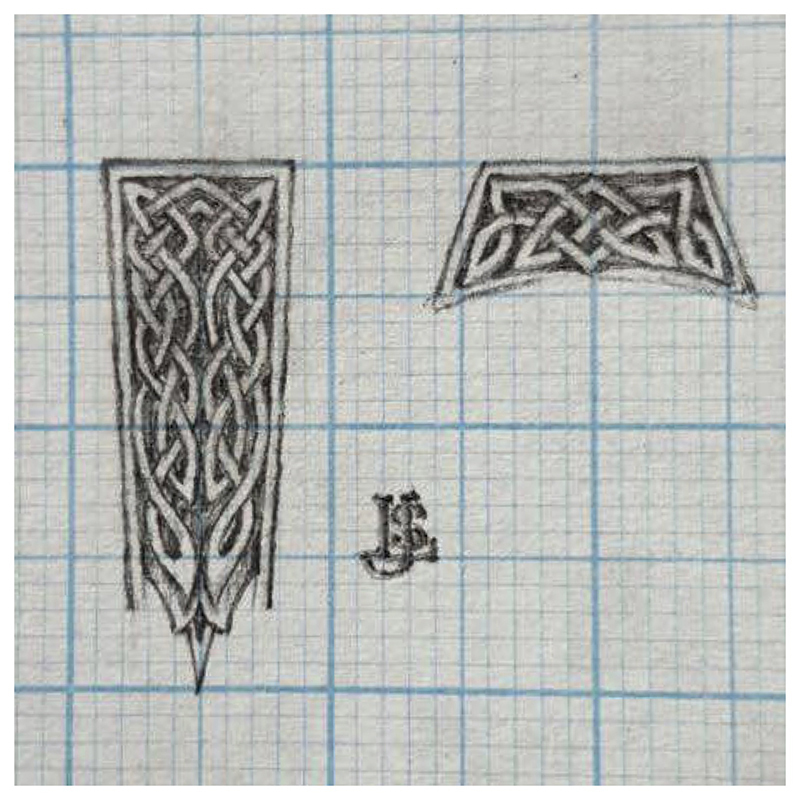 Comments : WOW! 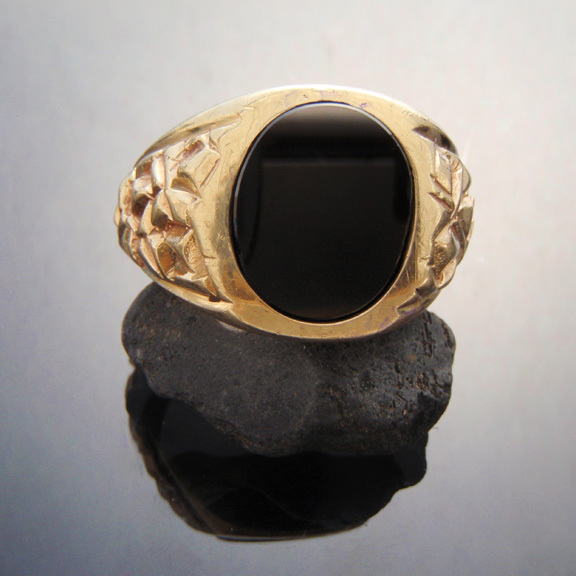 What a combination... black and gold! 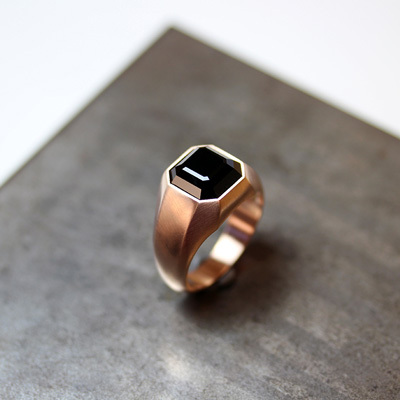 You've probably seen this style of ring before, its often worn as a man's ring. 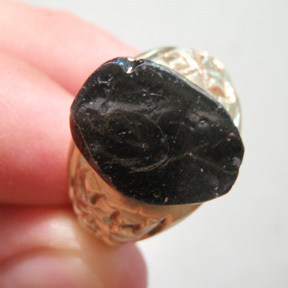 Usually the black stone is onyx, which in the majority of cases is simply agate that has been dyed black (yes, they do dye stones especially agates in many colours). 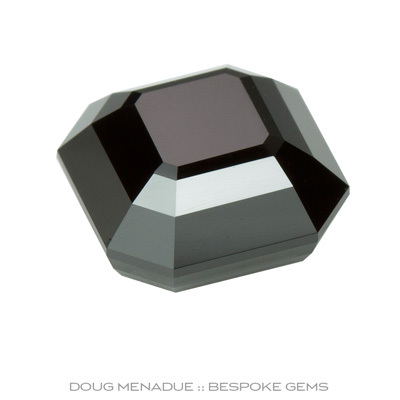 Naturally occurring black gemstones are very few and the best of the lot is black spinel. Black spinel is a pure jet black, its hard and takes an incredible polish. 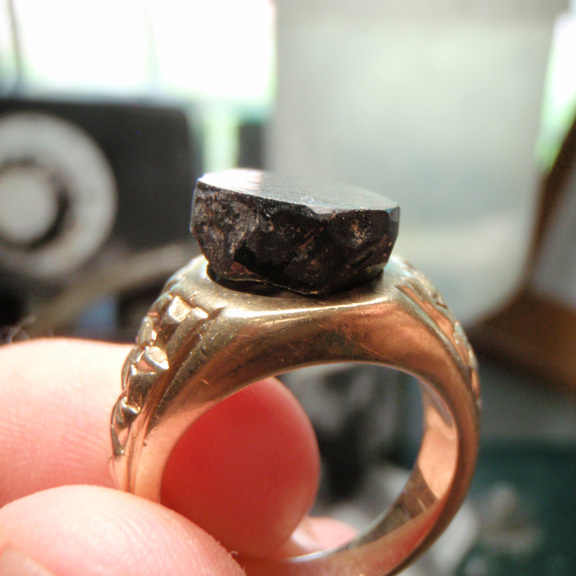 I cut this gem to replace a stone that had fallen out of a gold ring. 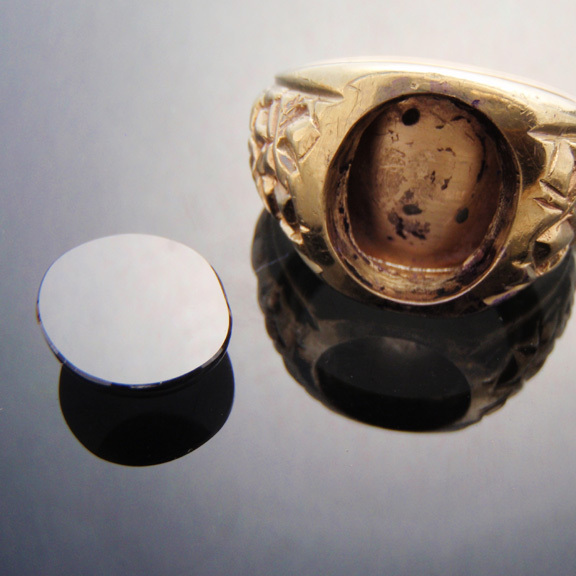 I had to cut the oval shape freehand in order to get the stone to fit the space for it. 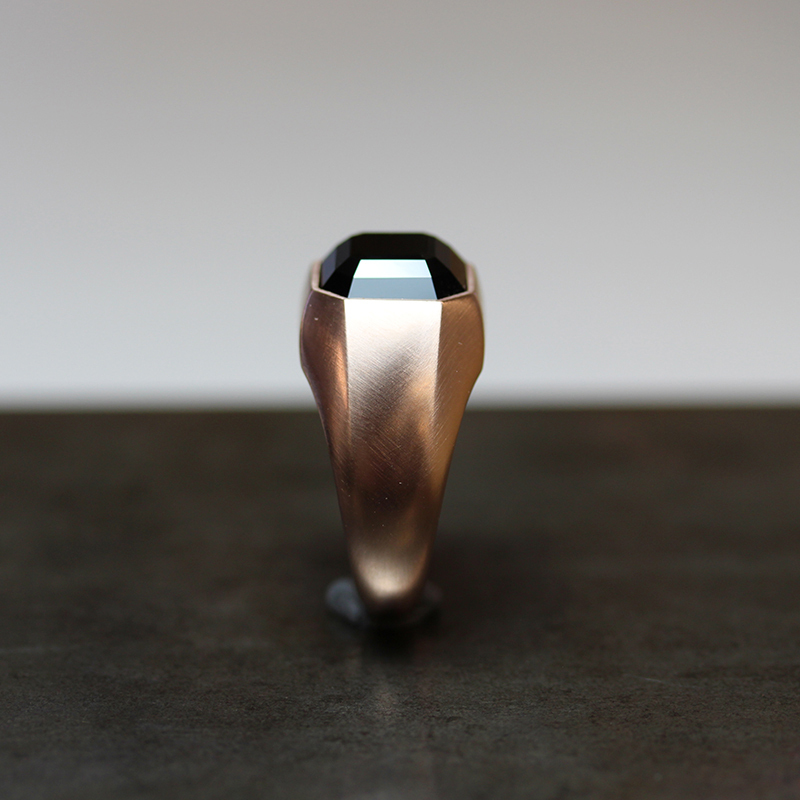 The end result is a beautiful stone that really sets the ring apart. 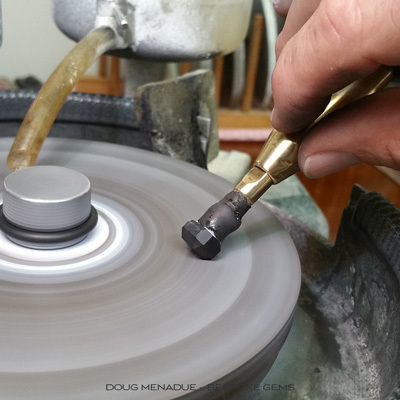 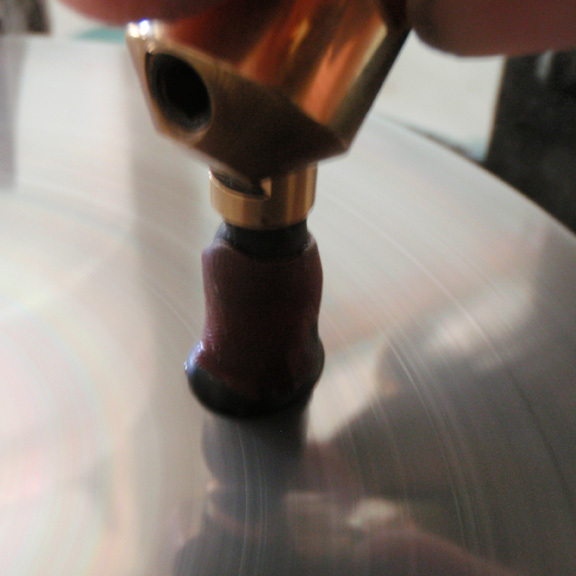 I have included some "action" shots to show you how the stone was cut. Comments : I do like black spinels! 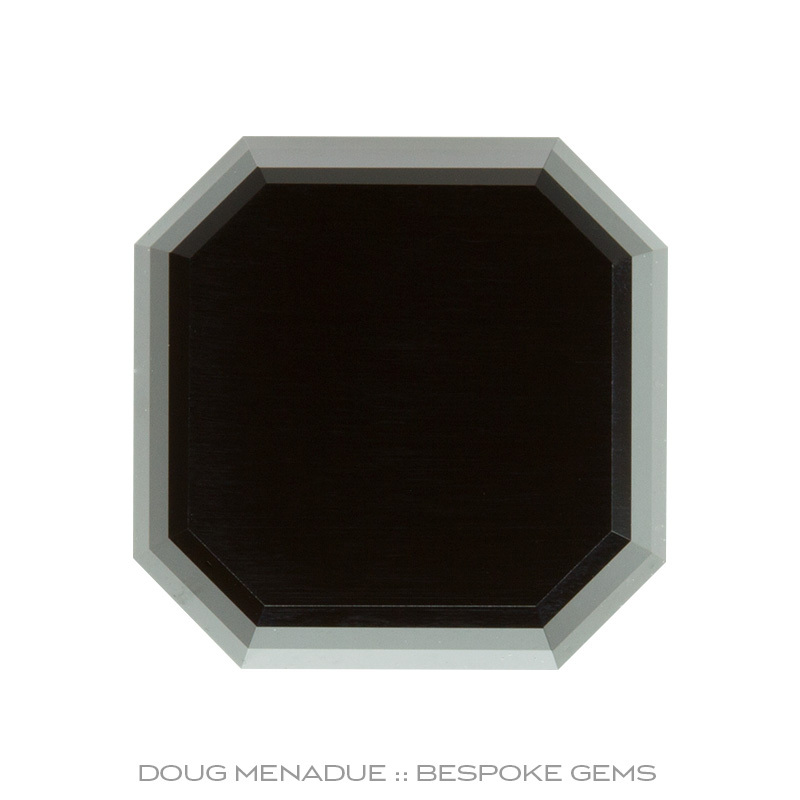 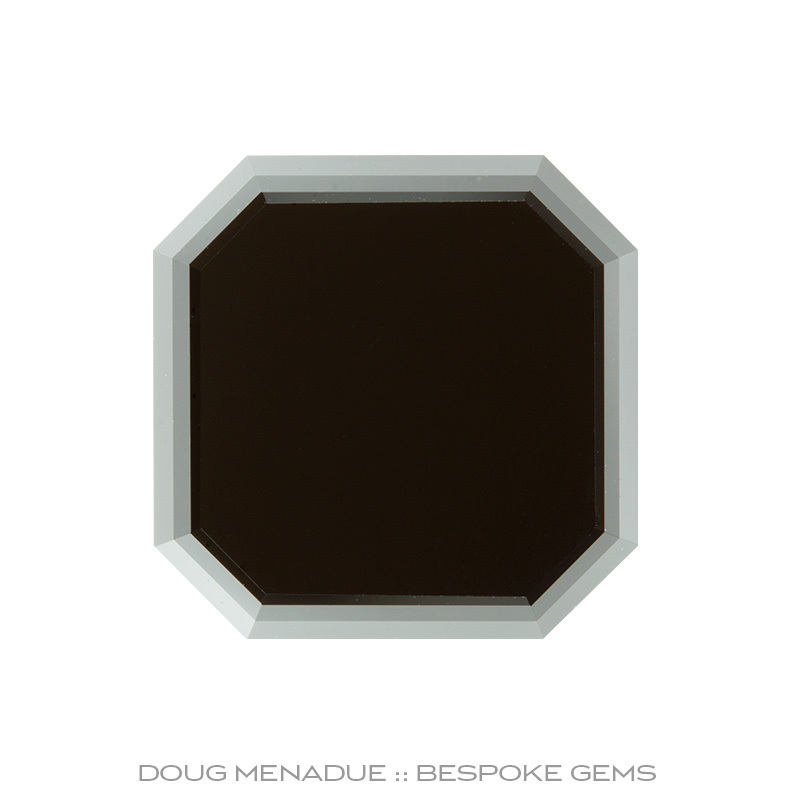 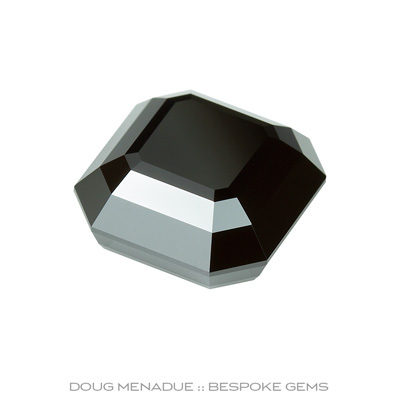 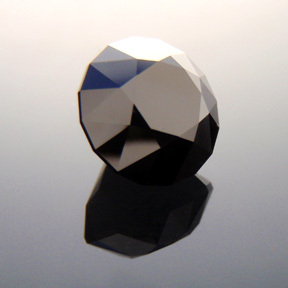 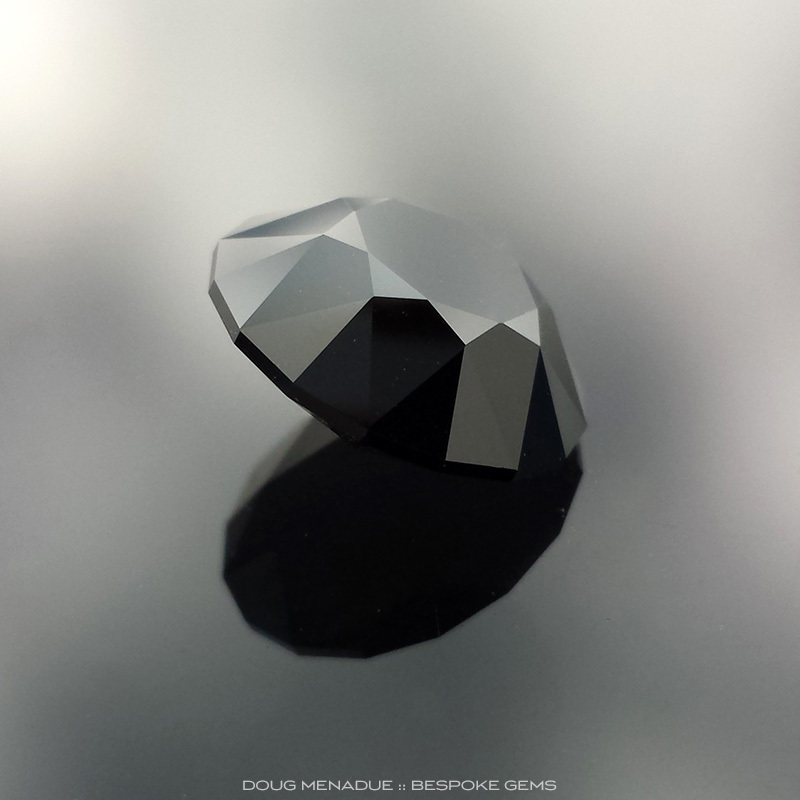 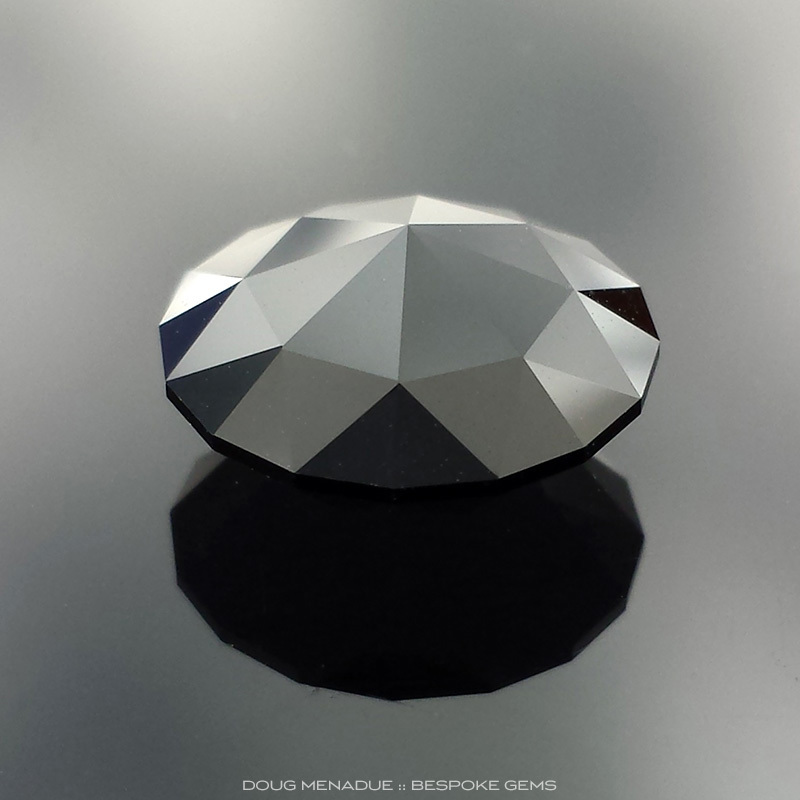 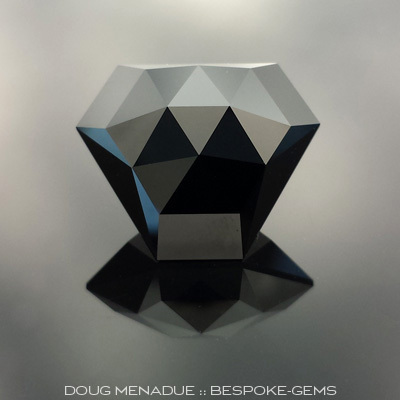 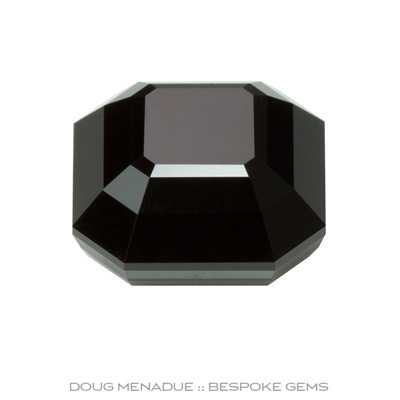 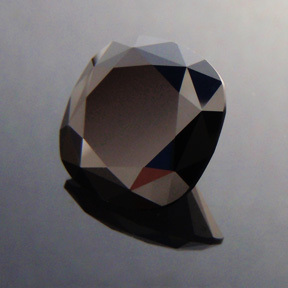 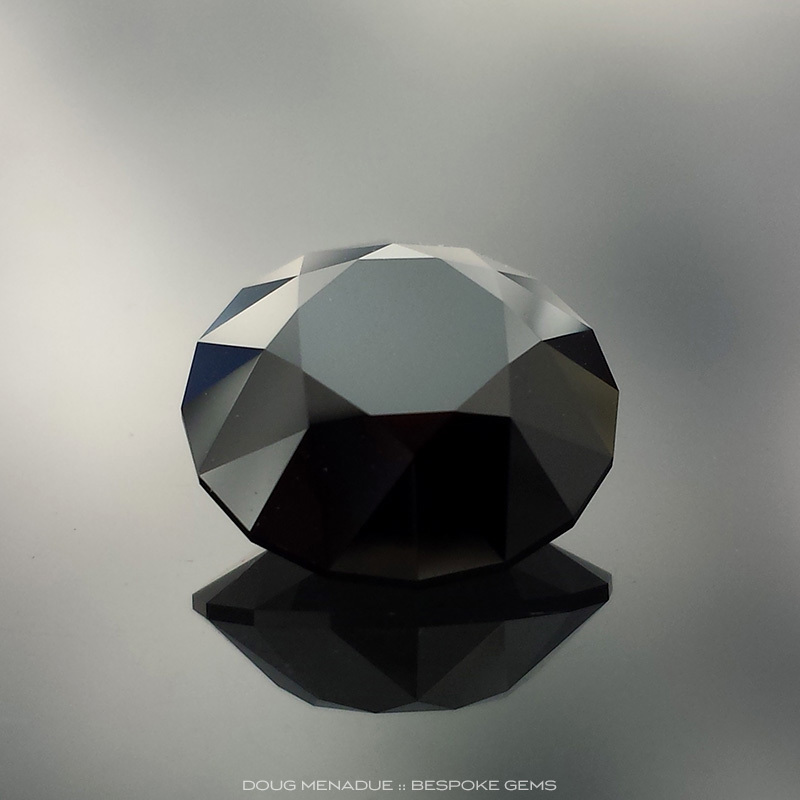 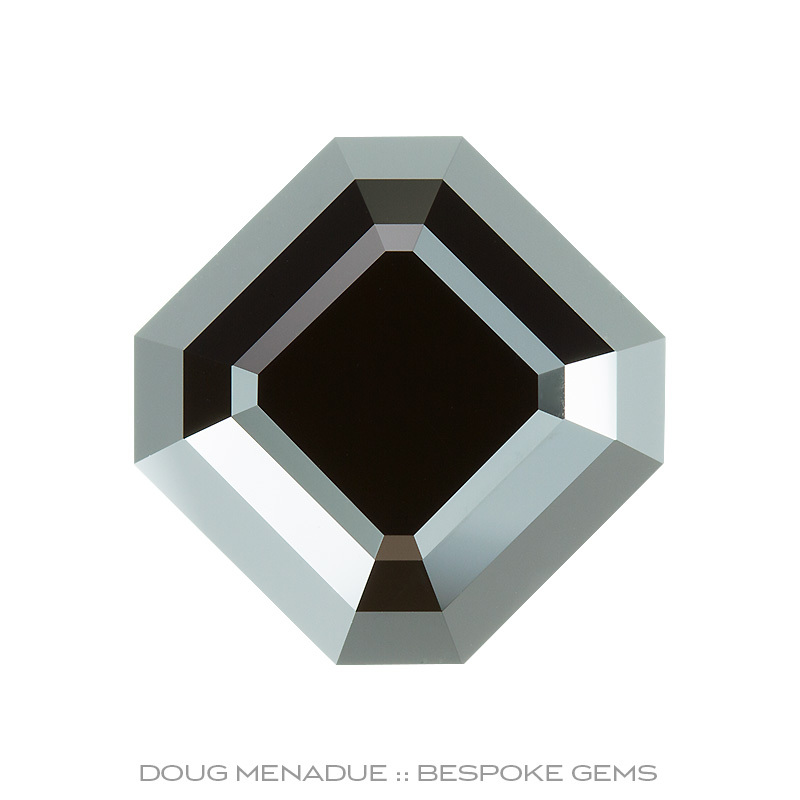 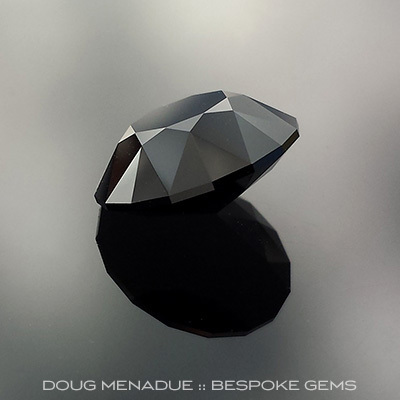 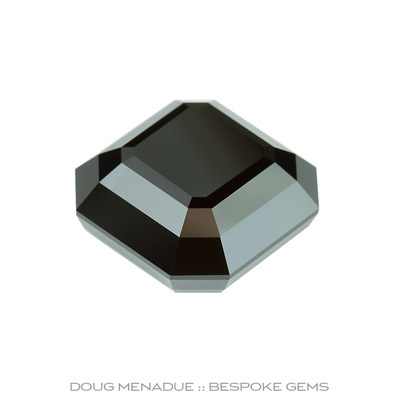 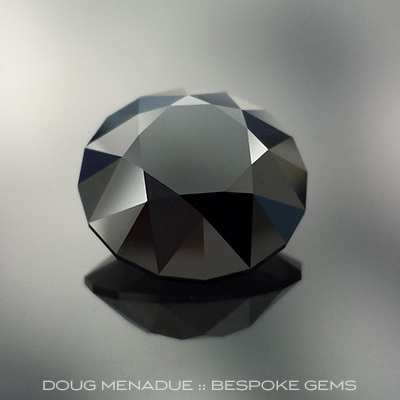 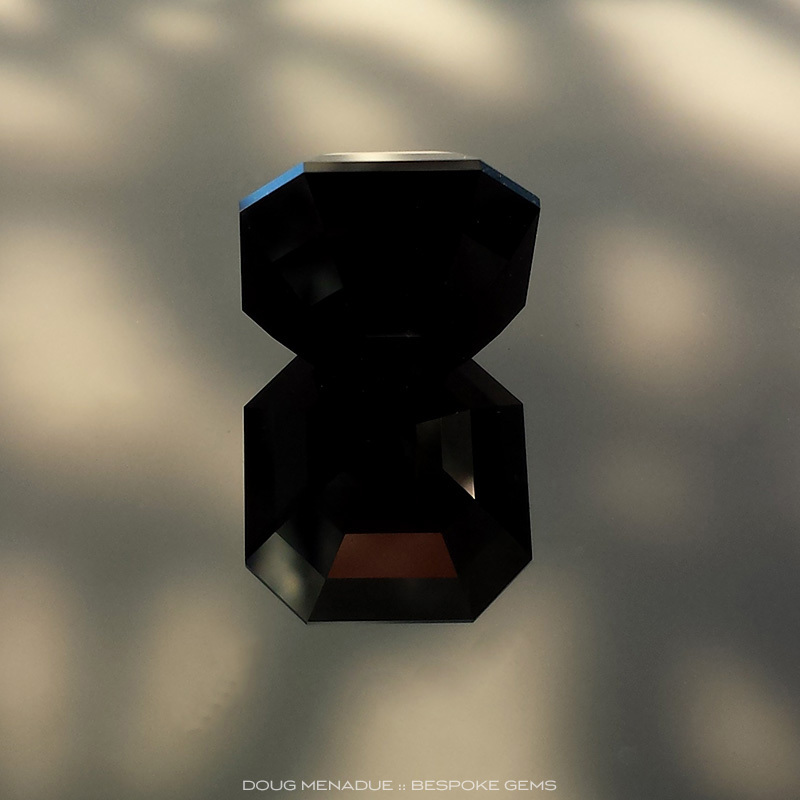 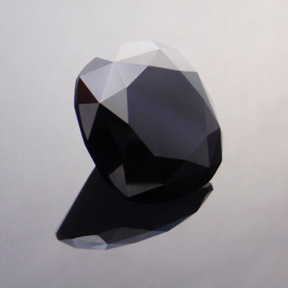 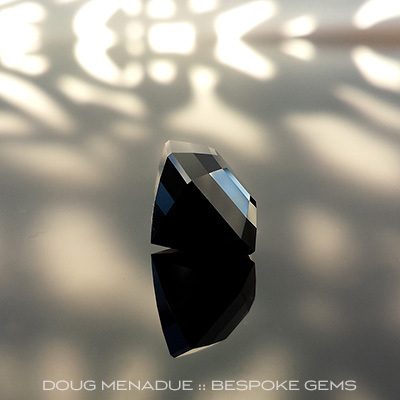 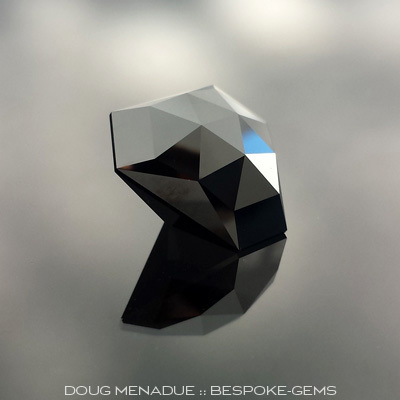 If you want to see just how lustrous and glossy a gemstone can be, check out a bespoke black spinel. 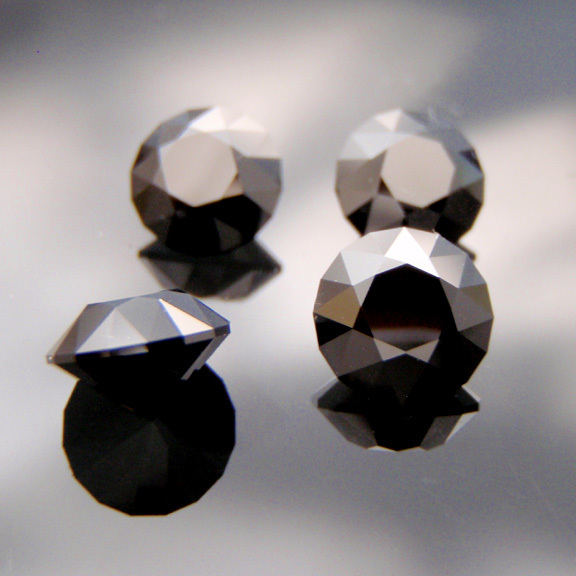 These gems are really beautiful, without equal when it comes to black gemstones. Comments : When it comes to black gemstones, black spinel is par excellence. 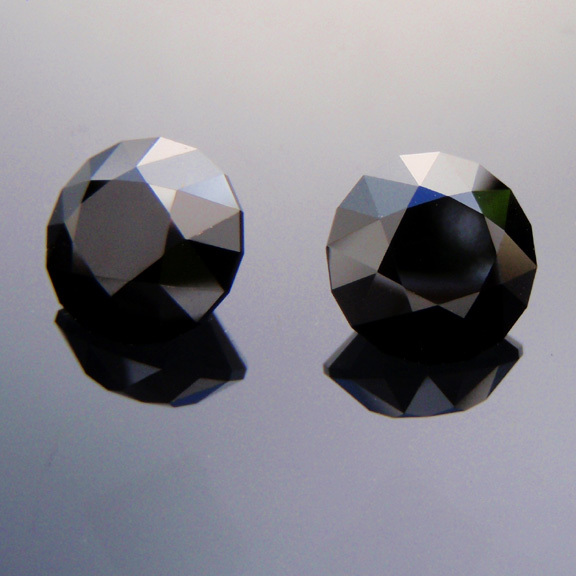 The incredibly glossy lustre and polish of black spinel is superb and something to behold. 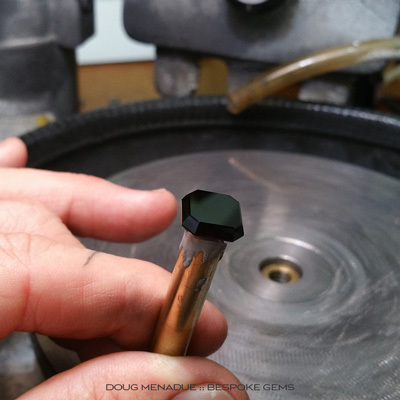 The colour is true black, no dark greens or dark blues here. 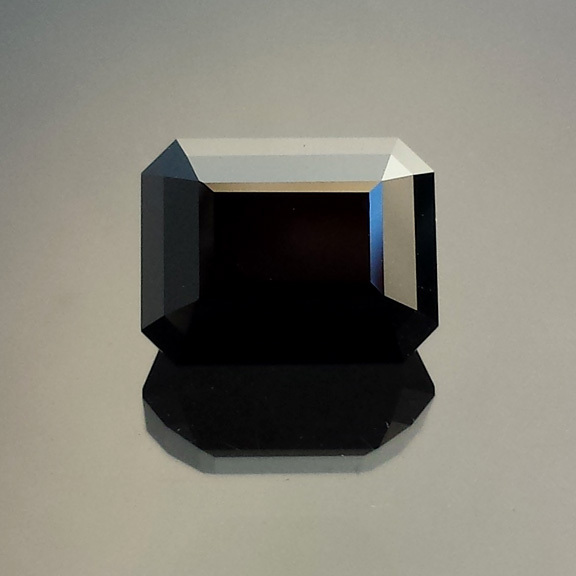 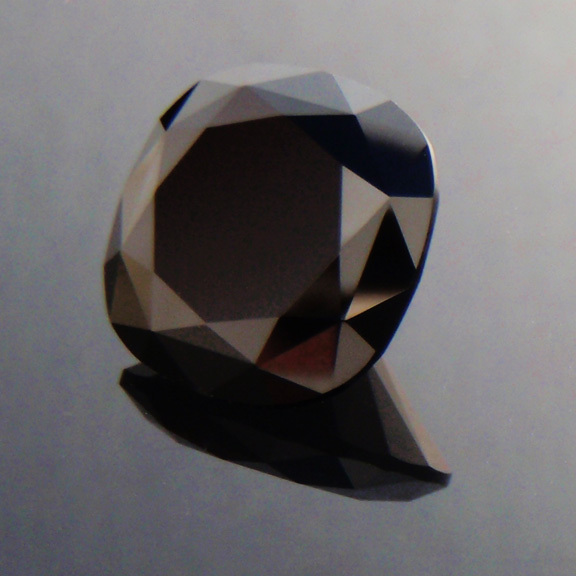 Black spinel is hard, being 8 on the Moh scale so it is ideal as a jewelry stone. Large spinel such as this one are very scarce, generally being found in the rough in smaller sizes. Some of the best black spinel is found in Australia on the Central Queensland sapphire gemfields around Rubyvale and in Tasmania. The beauty of black spinel is perfectly suited to my classical design, the Victoria Regent cut. 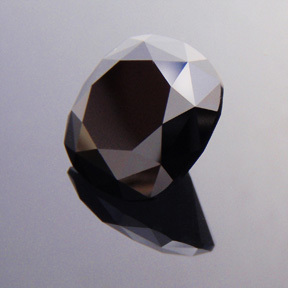 It works well in this design and the flash and reflections of the glossy polished facets is such that it creates a sense of transparency in being able to see into the stone. 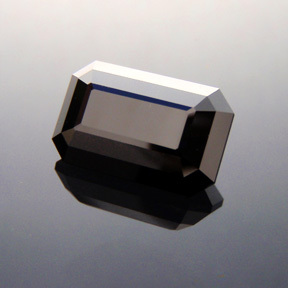 Black spinel is something special and this gemstone is a fine example. 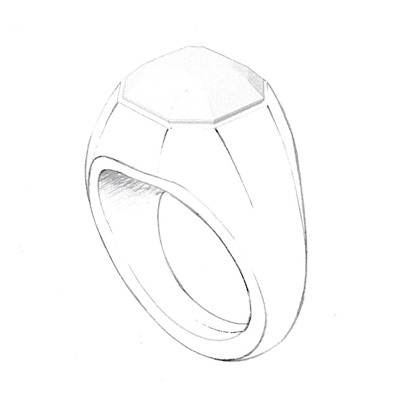 Imagine this gemstone set in white gold or platinum surrounded by diamonds... breathtaking! 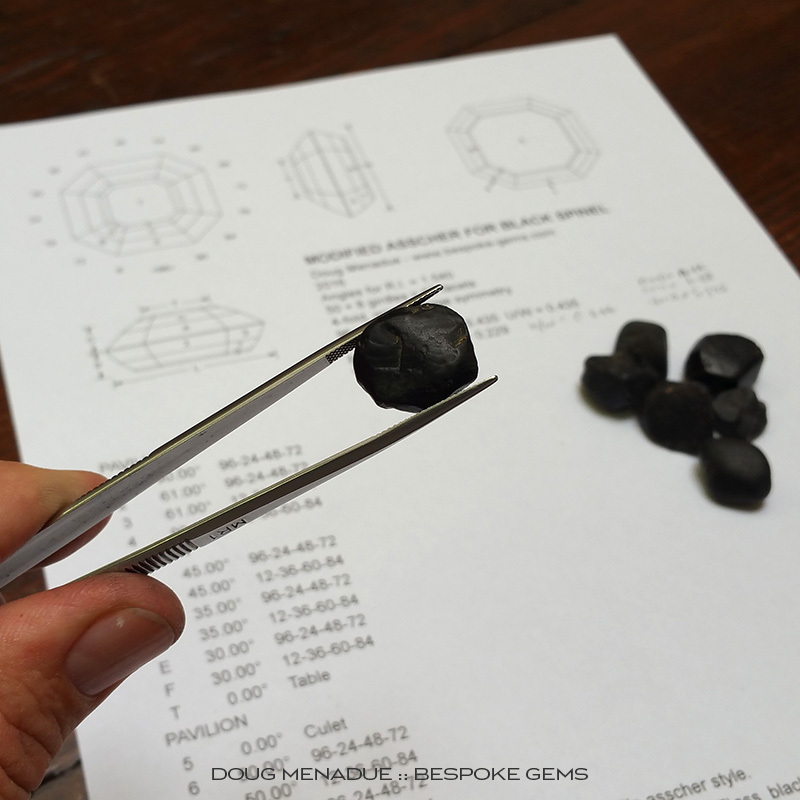 Comments : A big beautiful black spinel from the Central Queensland sapphire gemfields. This beauty is cut in a facinating design that features a swirling motion. It has a dome (hi-top) style crown and is really something special to see. A lovely black spinel gemstone! 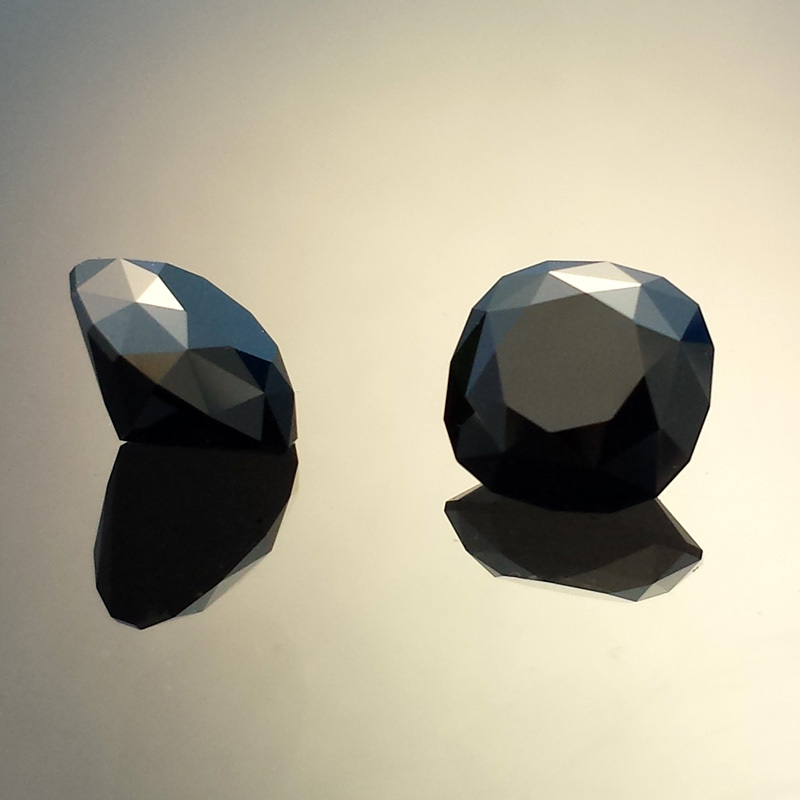 Comments : A special request order by a customer for a pair of step cut briolettes resulted in these little beauties. 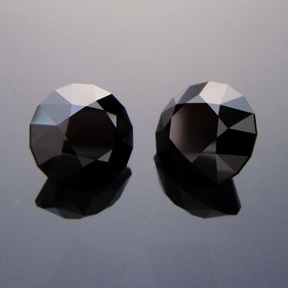 They are for a pair of drop earring and certainly add a wonderful finishing touch. 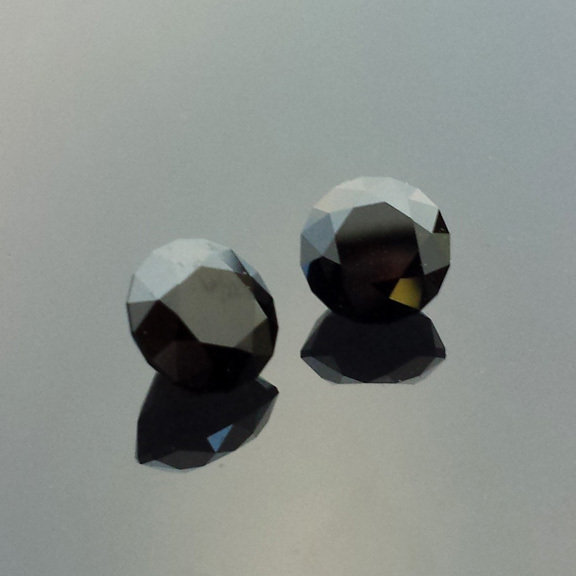 Comments : A wonderful matched pair of round black spinels. 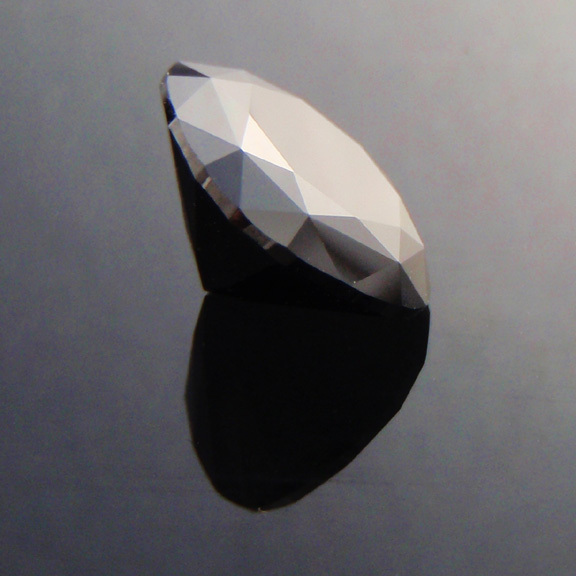 The design is basically a round brilliant style. 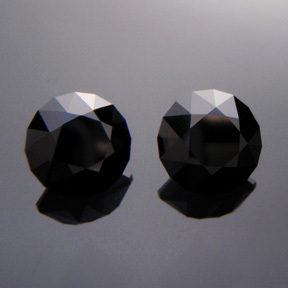 These gemstones are the beautiful glossy pure black that is the hallmark of black spinel. 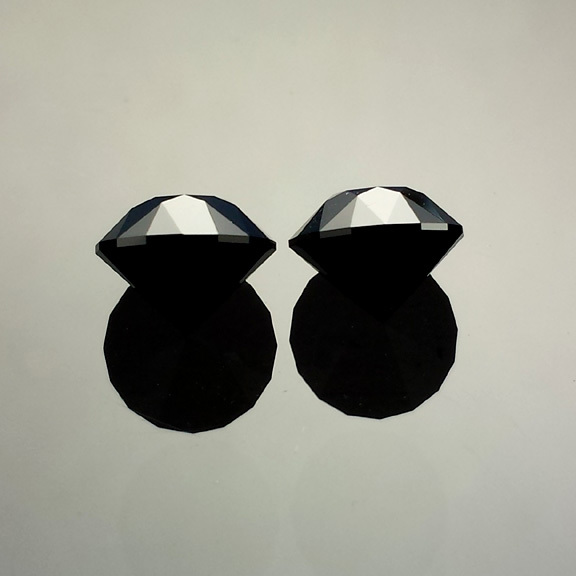 These are ideally suited for earrings. Comments : This is an unusual gemstone and something that you don't often see, certainly not one that has been precision cut like this beauty. 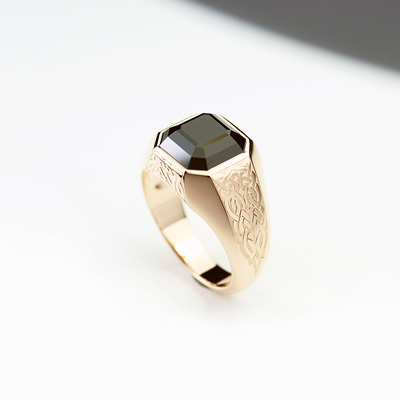 It is a black spinel that has been cut in a classic round design. 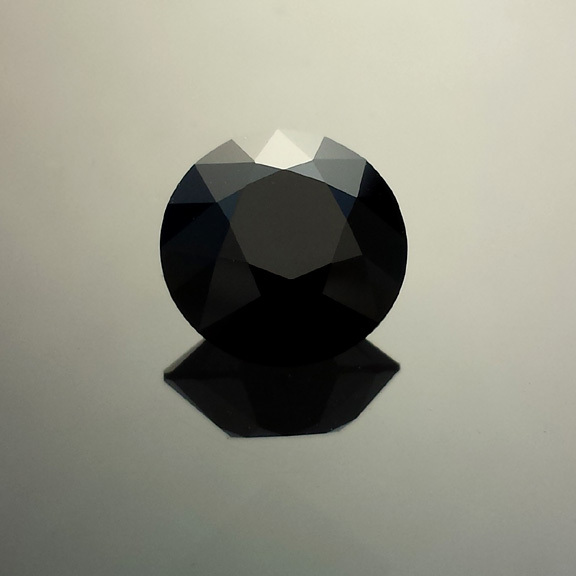 It is pure black and opaque... it is not transparent at all. 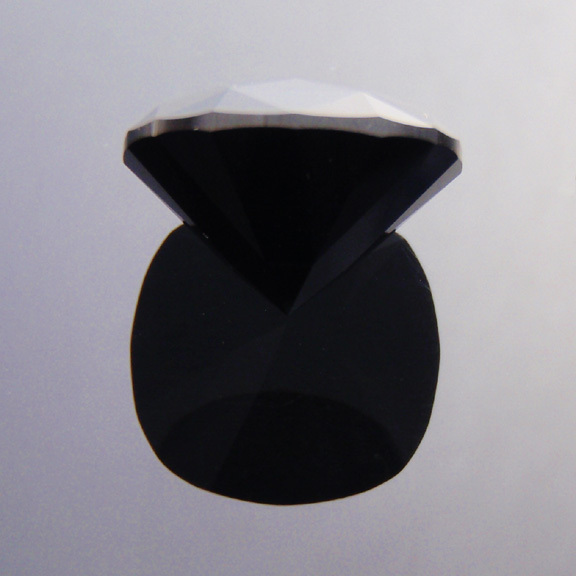 Being spinel it is quite hard and durable and takes a very glossy shiny polish. 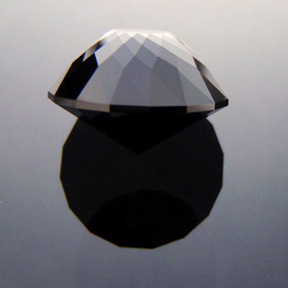 Most black stones, such as black onyx and black diamonds (yes, you can get natural black diamonds but the vast majority of commerical black diamonds...) have been treated either by irradiation, heating or have been dyed. Black spinels are completely natural and have not been treated in any way. If you are looking for a black gemstone, black spinel is for you! 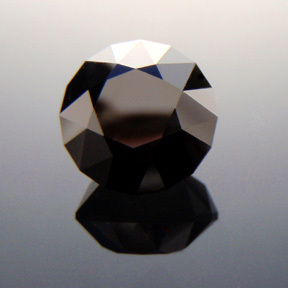 Comments : Black spinels are a true member of the spinel family but whereas the coloured spinels like red, blues, etc are transparent, black spinel is opaque. 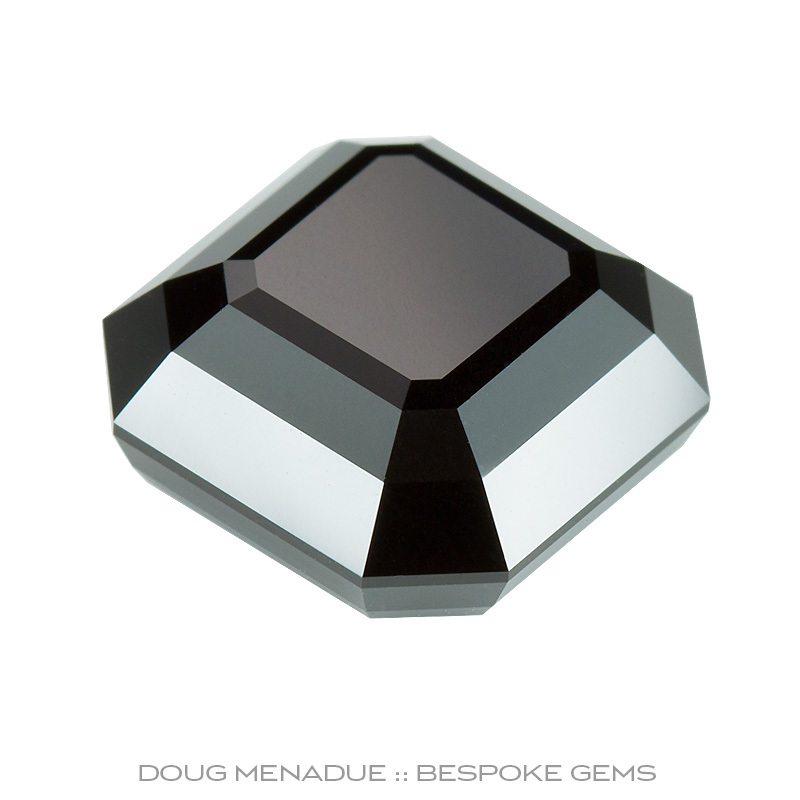 This is the same as black tourmaline. 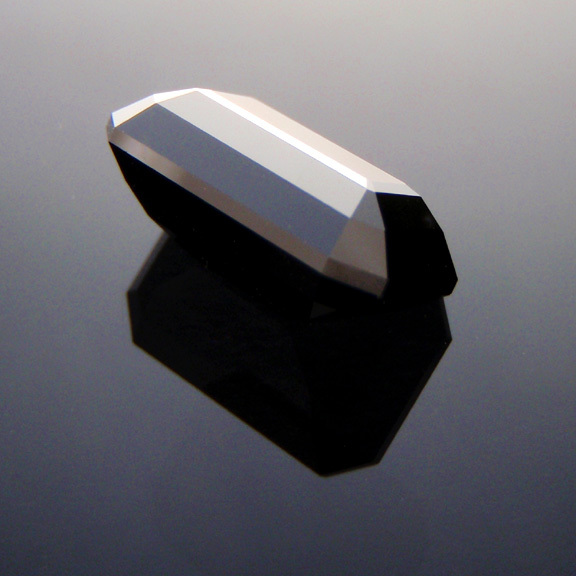 Black spinel is also known as Pleonaste and Ceylonite. 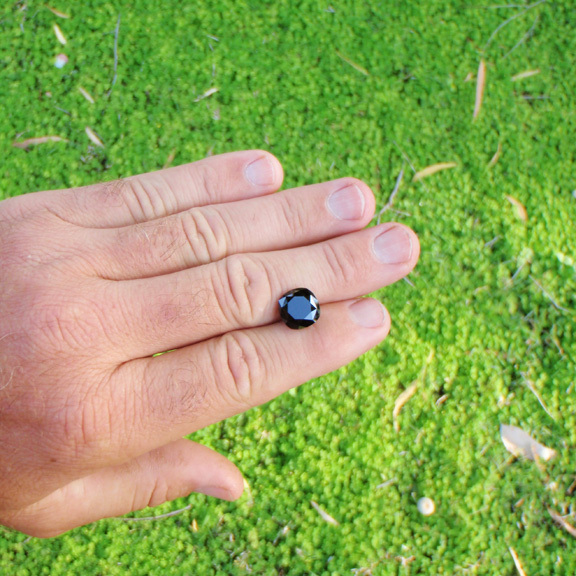 The black spinel that comes from the Central Queensland sapphire fields is a very pure black and takes a glossy shiny polish, though it is very messy to cut! 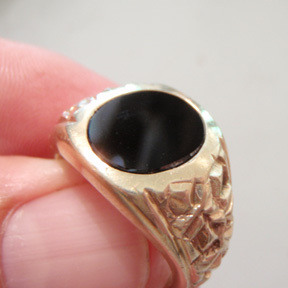 Most black stones in the marketplace, such as black onyx and black diamonds (yes, you can get natural black diamonds but the vast majority of commerical black diamonds...) have been treated either by irradiation, heating or have been dyed. 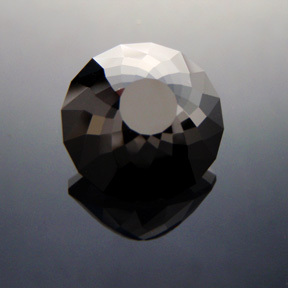 Black spinels are completely natural and have not been treated in any way. 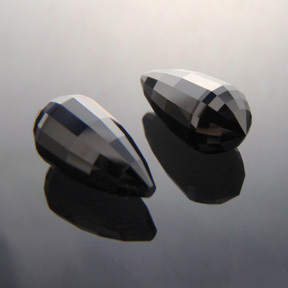 Jet is another black stone and has often been used in mourning jewelry however it is quite soft at 2.5 - 4 on the Moh's hardness scale. If you are looking for a good black gemstone that hasn't been treated and is suitable for jewelry then black spinel is for you.